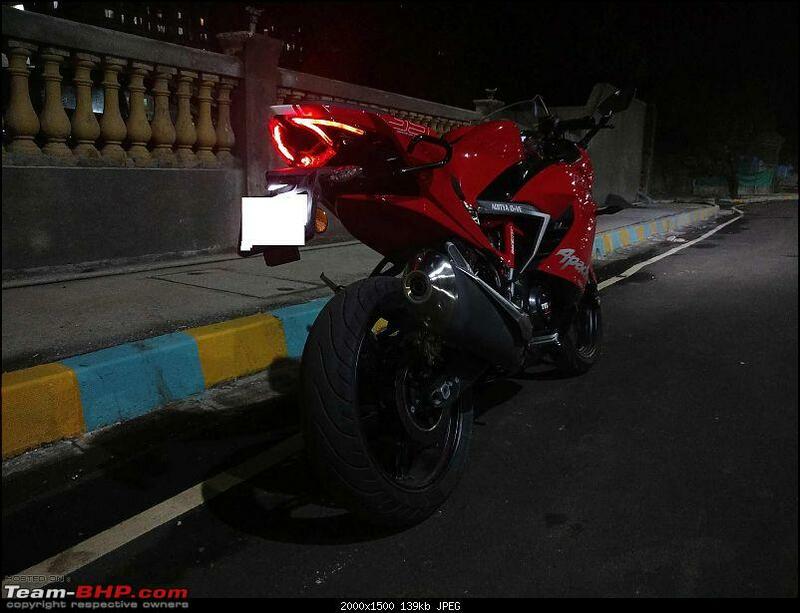 When I saw the TVS Akula concept at the 2016 Auto Expo in Delhi, I had never imagined in my wildest dreams that it would be a production version of this motorcycle that would join my garage in the next few years. I drooled over the Akula which showed off its full carbon fibre body with all the latest technology poured in. Later on, a thought crossed my mind that just like most concept models, the design and features were not likely to make it to the production spec model anyway. I was already hooked to Team-BHP and kept myself updated with the 'Akula unveiled' thread on a daily or weekly basis depending upon my work load. Days and months pass by and we’re in September 2018, when my pre-worshipped Avenger 220 starts acting funny, giving a new problem every now and then. 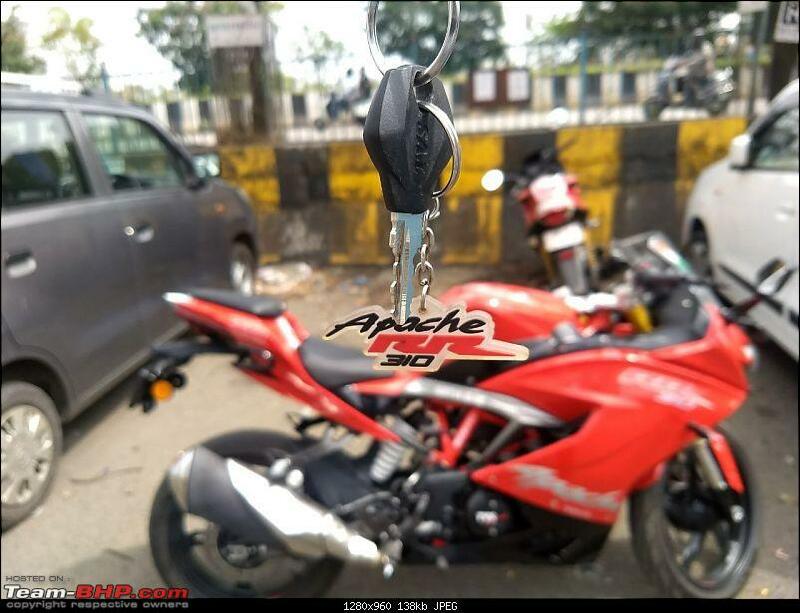 After numerous conversations with a few other enthusiast friends, I take a call that a few small issues have to be fixed post which the bike has to be put on sale. 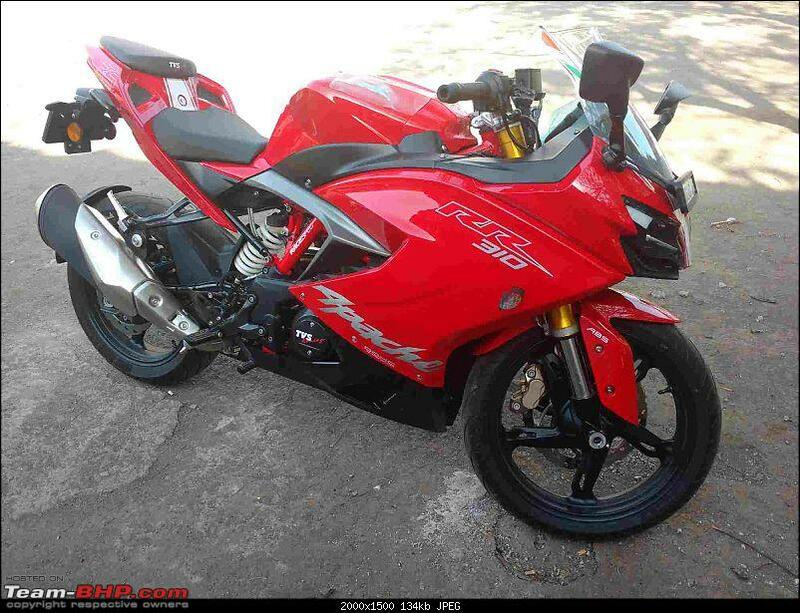 Meanwhile, the search for a new motorcycle begins. 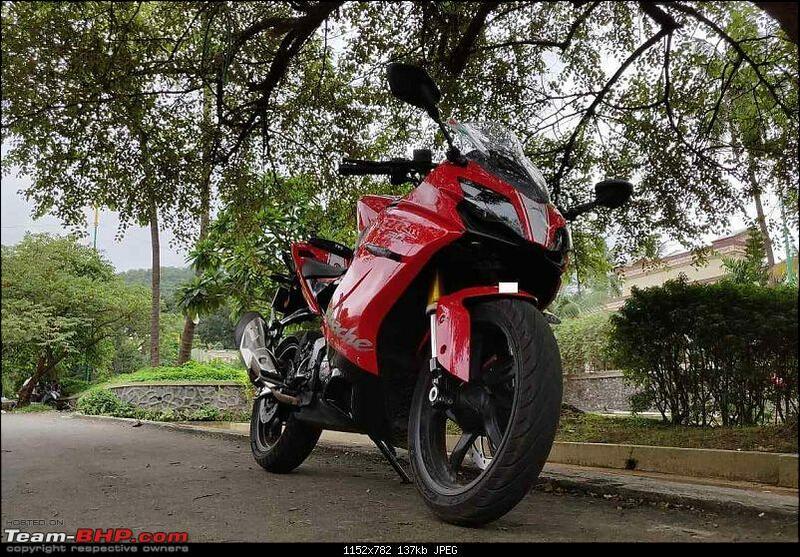 I didn’t have any motorcycle in mind that I actually liked before thinking of getting a new bike; hence there were only a few parameters such a more reliability, comparatively lower maintenance (than a Bajaj) safety (ABS) and more power. 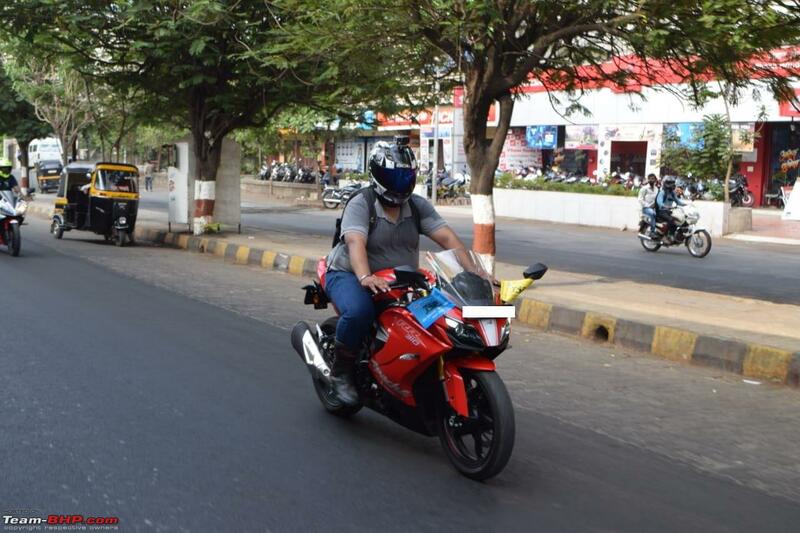 I had already ridden the Bajaj Dominar 400 for official purposes, doing a Pune return trip for the same. 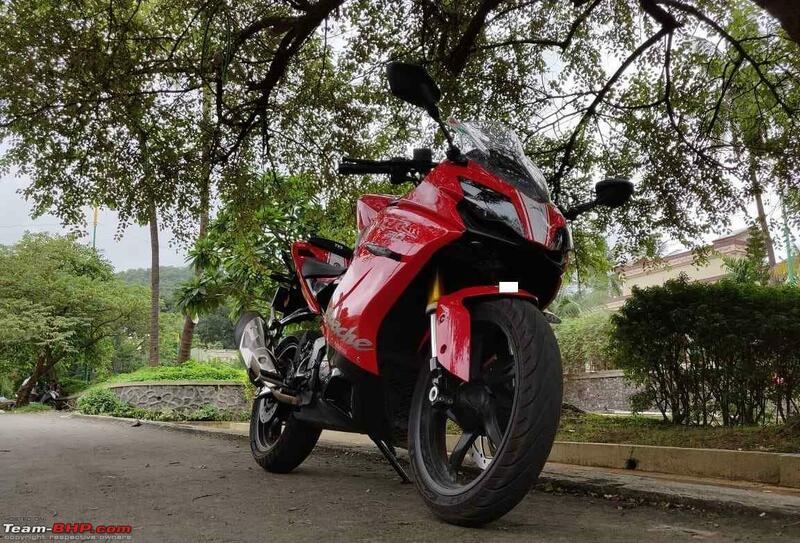 While the bike and its features were quite to my liking, the vibrations on the seat and the Bajaj reliability (frequent visits to ASC or FNG for the simplest of problems) made me put this out of the list without much thought. 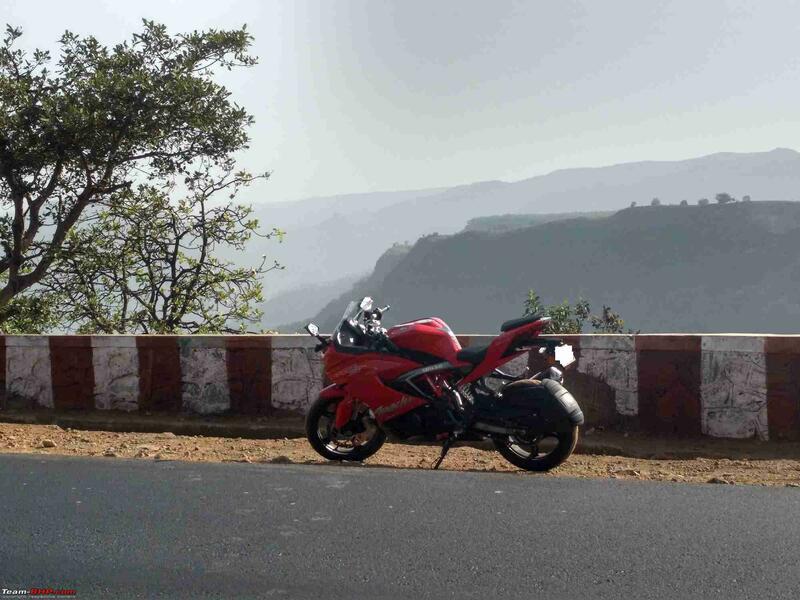 I had ridden the RC200 and wasn’t comfortable at all due to its committed riding posture and hence didn’t even bother to take a TD of its elder sibling. 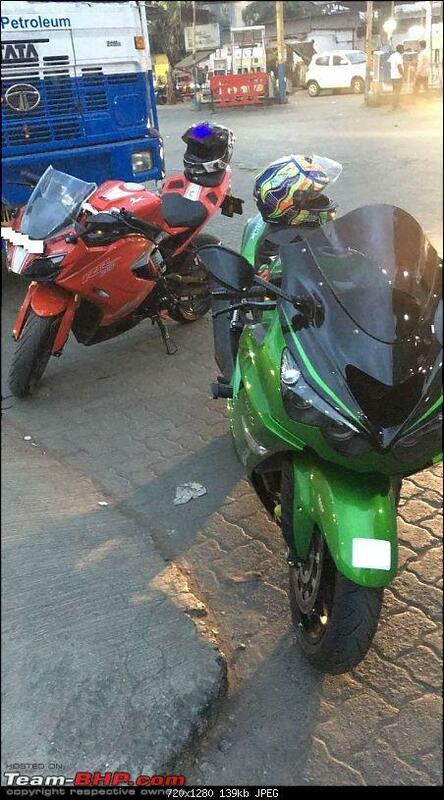 I thought that the Duke 390 would be a better option and hence rode down to the KTM Thane showroom. The guys at the showroom were kind enough to share the brochure and show the bike while explaining its features. I requested them for a TD which they promptly agreed to. The sales guy asked me to take the adjacent service road and come back via the main road which was about half a km one side. 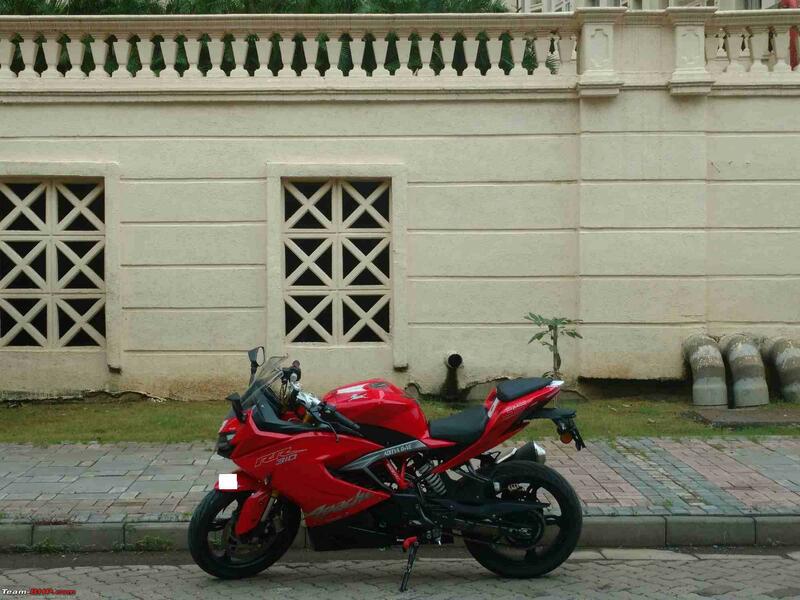 I calmly rode the bike to begin with due to slight traffic and thought of testing her once I’m on the main road. 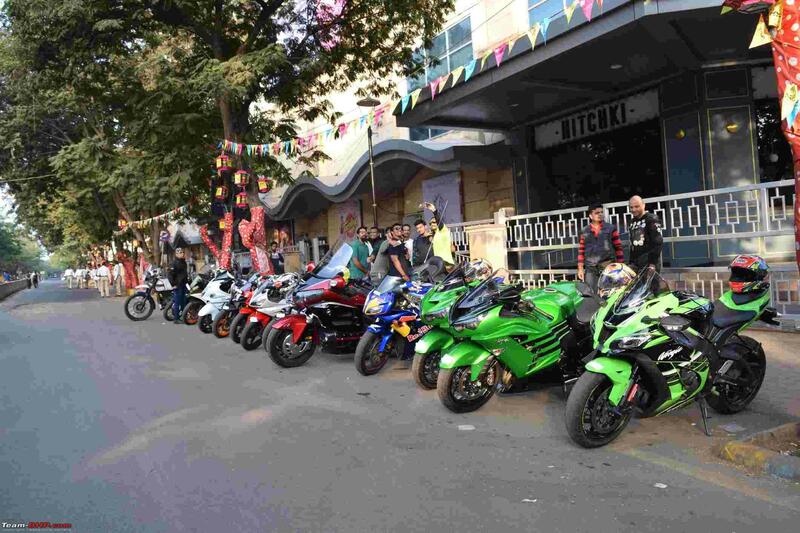 I begin riding on the main road by down shifting from third to second gear and pulling the throttle to the limit to test the power and torque. BIG mistake! I knew the KTM’s were aggressive but to this extent, it shook me to the core. 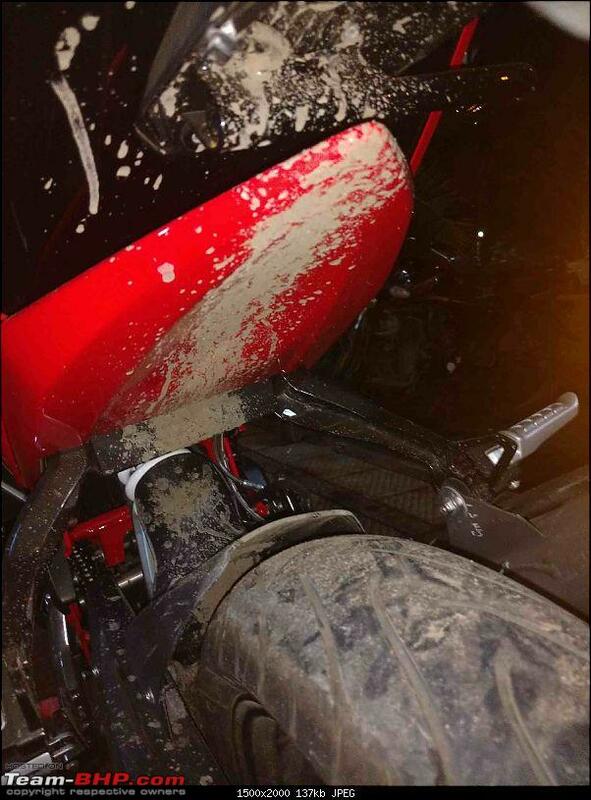 Post the down shift and the pulling the throttle; I witnessed the front tyre is air-borne. 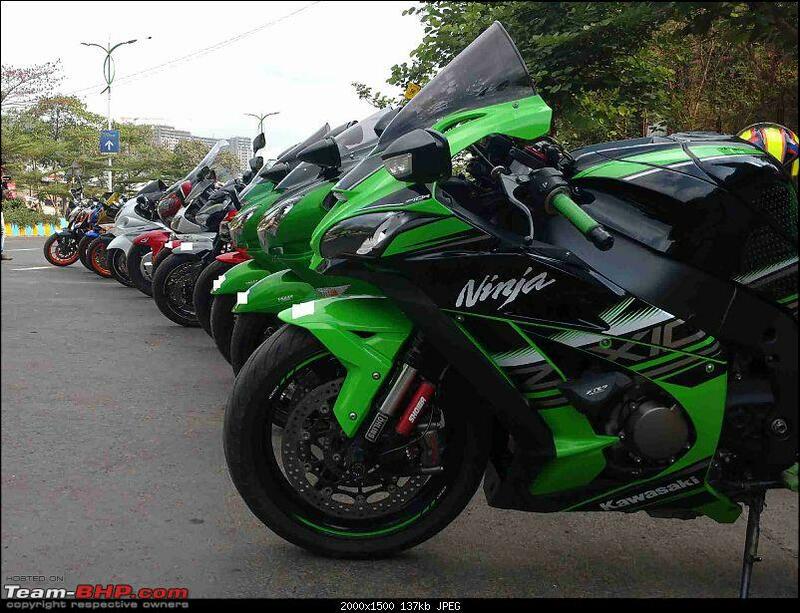 And for a motorcycle of that size to pull a hefty guy like me, I was left awe-struck till the time I returned the bike. I’ve heard people saying that you should buy a bike that scares you a little if not much, but trust me; this was way too much for my liking. Though I liked the coloured screen, Ride-By-Wire and various other features, the aggressive nature and the loud colour options were a put off. 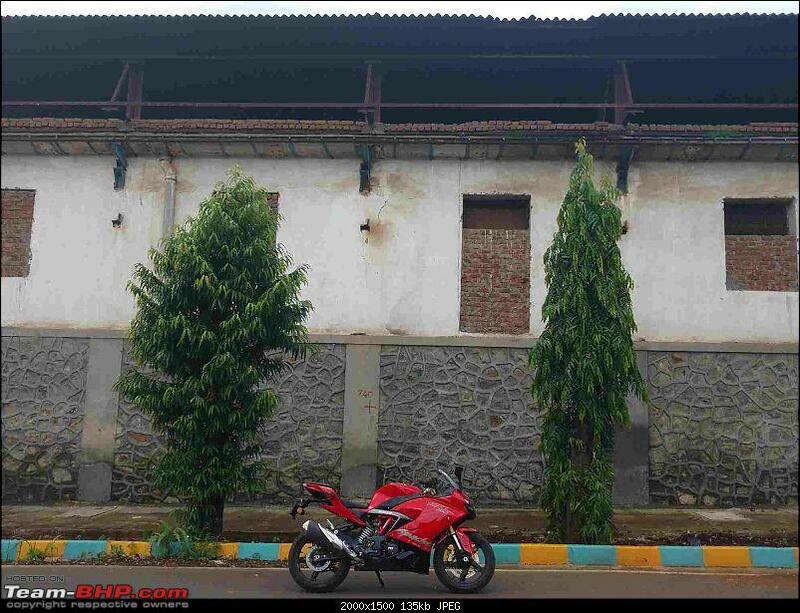 Post the Duke 390 test-drive, I went straight to AIMS Yamaha to test the FZ25. I’m not a big fan of Yamaha designs, but I didn’t want that feeling of not having tested any bike in the future so went ahead with it. I entered the showroom which was buzzing with activity. The receptionist was busy on a call so I went ahead and checked out the display bike. A few minutes later, a sales guy came forward and asked me if I was interested in the bike. I replied in affirmative and he went on to explain the features and price break-up. No brochure was a downer, nonetheless I asked him for a test drive to which he said they don’t have a TD vehicle. 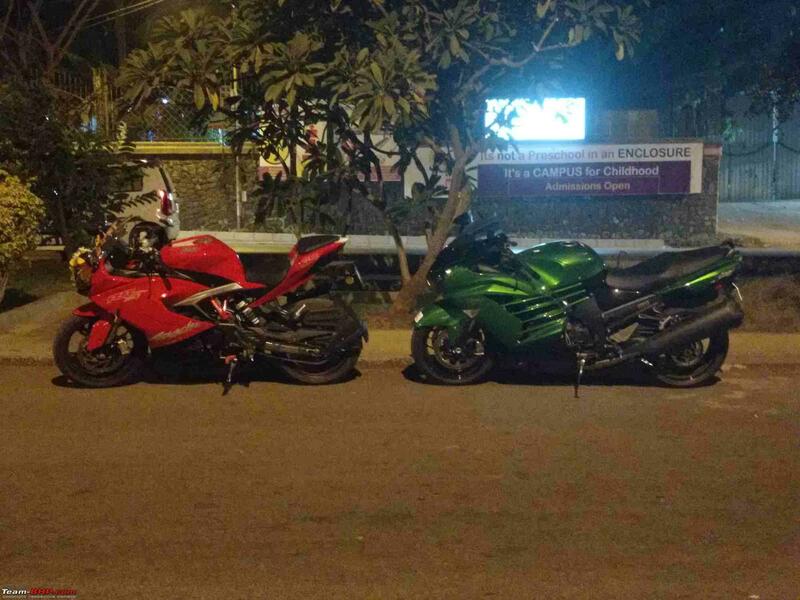 I was about to leave when he offered me to ride one of the new unregistered bikes. 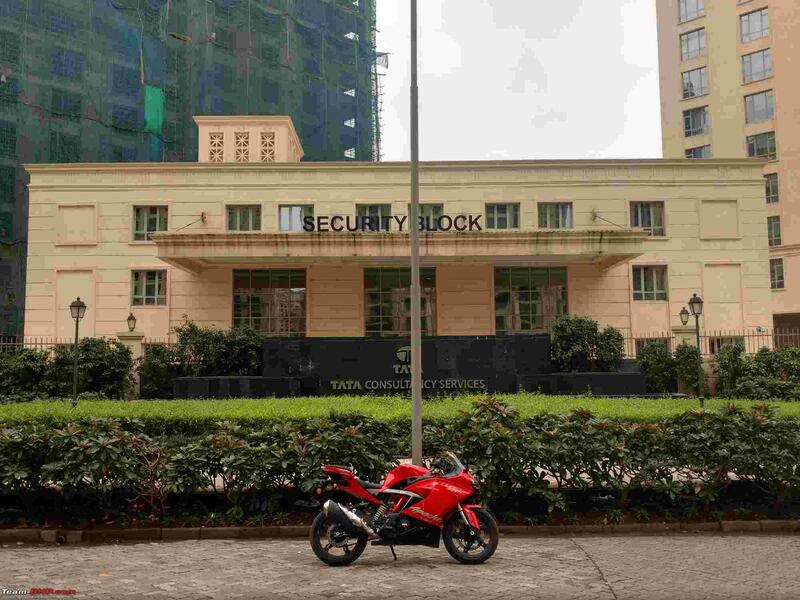 I thought what the heck, Yamaha’s are refined and I won’t get a long test ride anyway due to the lack of registration (I do feel guilty now for testing a bike which someone must be owning now without having the knowledge of me using it as a TD vehicle). 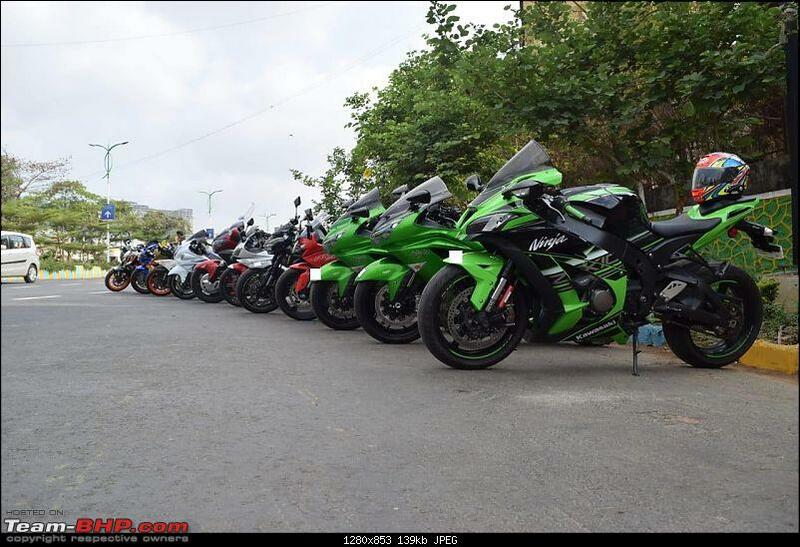 The TD was a mere 200-300 metre ride on the same road where the showroom is located, nothing that struck a chord with me save for the super refined engine. 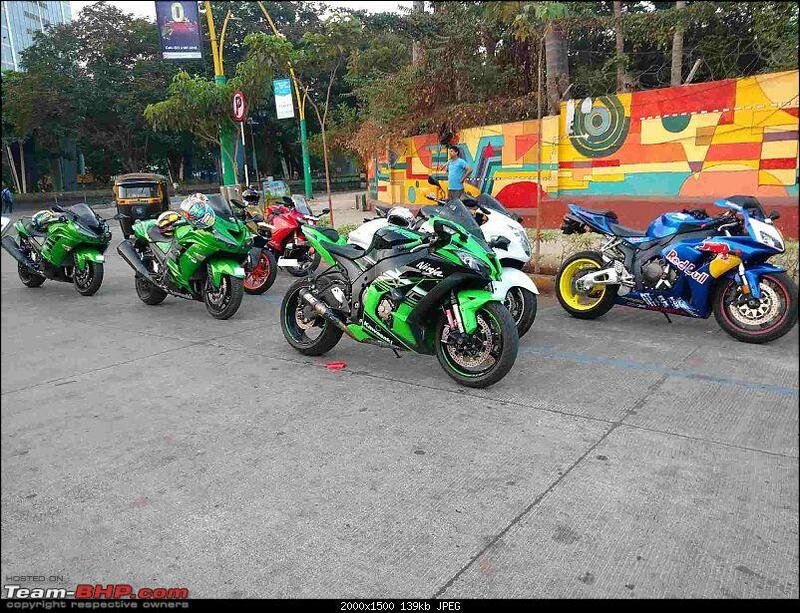 Parked the bike, took the price break-up on a sheet of paper and left. Luckily, I didn’t receive any follow up calls. I had the Mojo with me during a long-term review in my office for a period of about three months. Those three months were pure bliss for me! I was absolutely in love with this bike for various factors including the sheer size of this mammoth, the exhaust note after removing the DB killer and the more than decent power and torque the 300cc engine had. 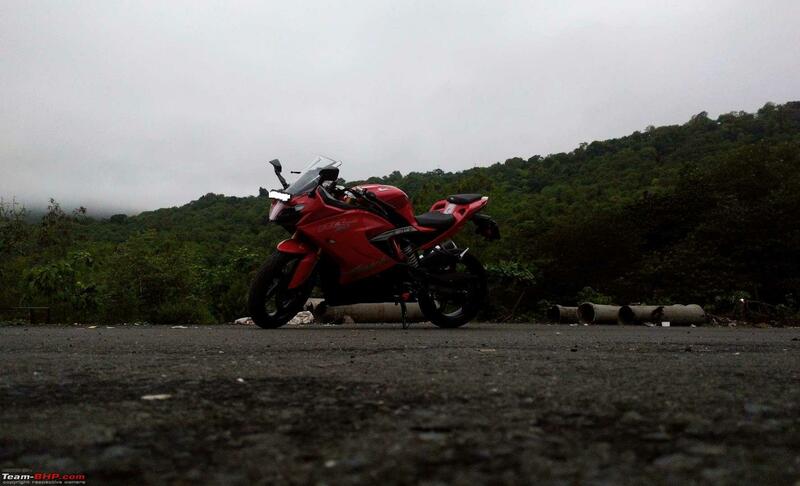 I had liked the bike so much that I took her to Pune when I was visiting a friend. The bike returned a fuel efficiency of 32 kmpl during the trip, which was not at all bad for a bike of this size and class, add to it the fact that I was doing spirited riding. 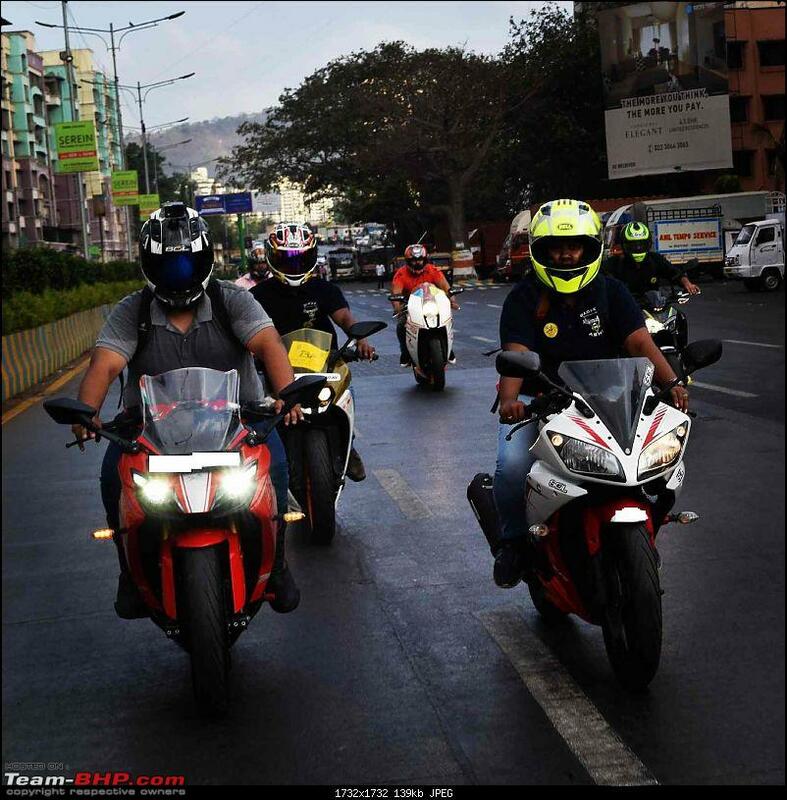 What did put me off though were a few factors during this ride itself that included the heavy profile of the motorcycle, the reliability (headlamps conked off while returning in the dark from Pune) and the large foot pegs that limited its cornering capabilities. The fact that it did not have ABS made didn’t help its case either. Here goes another one off the list. After considering the RC390 and the 302R is when it hit me that I had a liking for faired motorcycles. Good or bad? Find out as you read on. 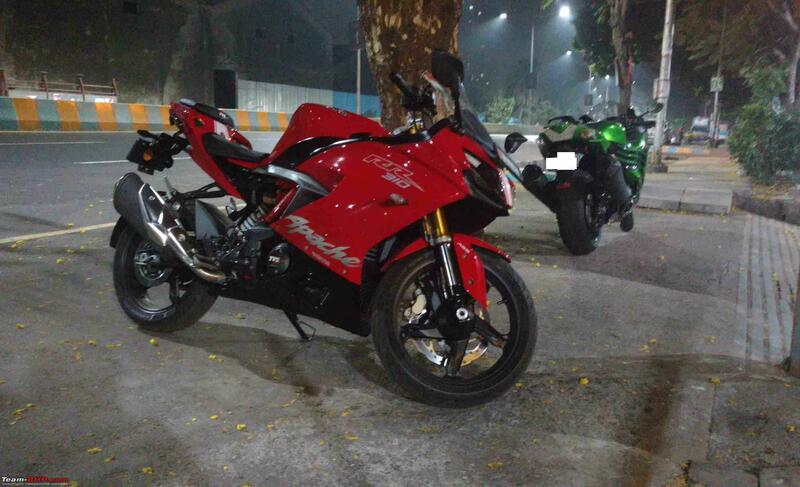 I call up Benelli Thane (now Moto Royale Thane) and ask them if the 302R and 600i is available for a test-ride as I like both the models from the brand (probably would’ve even stretched my budget for the 600i). They respond in negative and I don’t bother to converse further, hence hang up. 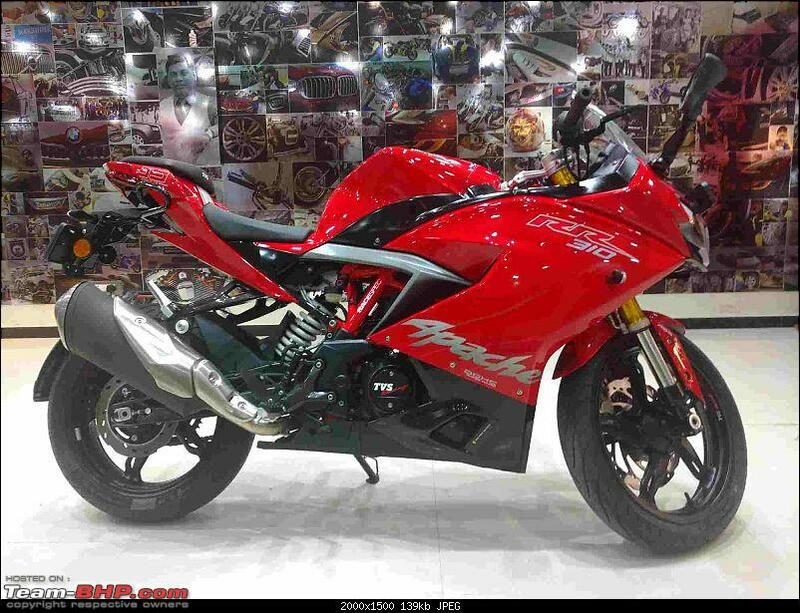 A few days later, I see a sponsored post from Benelli India in my Facebook feed and put my opinion in the comments section regarding the lack of TD’s available in the showroom. I receive a call later in the day from the company’s call centre asking for the issue I faced and if I would be interested in a test ride that they plan to arrange. I agree and fix an appointment for the next week. I land up at the showroom the next week and am greeted by the manager who shows me the 600i. When I ask him about the 302R, he says that the 302R has still not been dispatched to his dealership as yet (so much for the company calling me based on my feedback on FB when they themselves haven’t sent a TD bike). Anyway, I go ahead and request him for a TD of the 600i. He first takes me to the display bike, explains the features and price break-up, loan options (at least ask me if I’d be taking a loan or if I’m going to pay in full up-front before judging my background and wealth). Post the explanation, he took the display bike off the paddock stand and asked another guy to take the bike out. The sales guy asked me to take a small round of barely 200-250 metres before taking a U-turn for the showroom. Meh! I took the TD nonetheless and as you might have guessed, I couldn’t make out anything of it. Thanked the sales guy later and left the showroom. 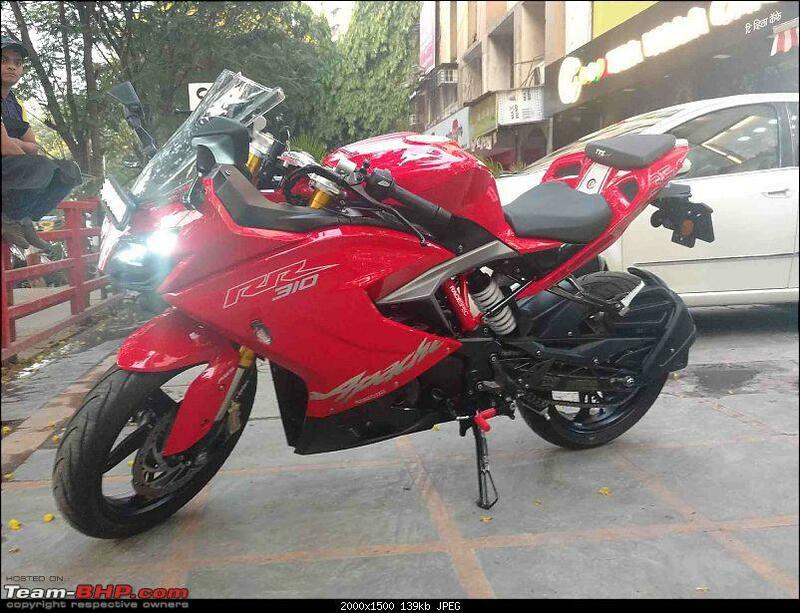 I could’ve considered the 600i but there were so many negative reviews about the bike and the service centres that I didn’t feel like going ahead with it. Not to forget the fact that I had gone there basically for a TD of the 302R, the call back for which I am yet to receive! I had seen the RR310 only via images available on the web before I made the booking. I thought that I can cancel the booking if I don’t like the bike post the TD. The cancellation amount was worth the effort of reducing the waiting period if at all I go ahead with the most advanced Apache till date. I knew she was a looker, no doubt there. She had the engine and mechanicals from BMW hence that wouldn’t be an issue from the reliability point, and the fact that TVS would manage after sales meant it wouldn’t cost me too much. 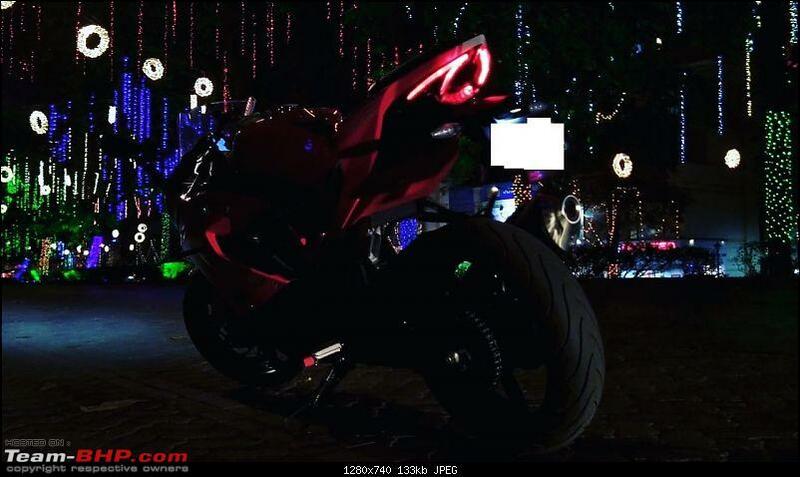 TVS launched the RR310 exactly a year ago, December 6, 2017 to be precise. 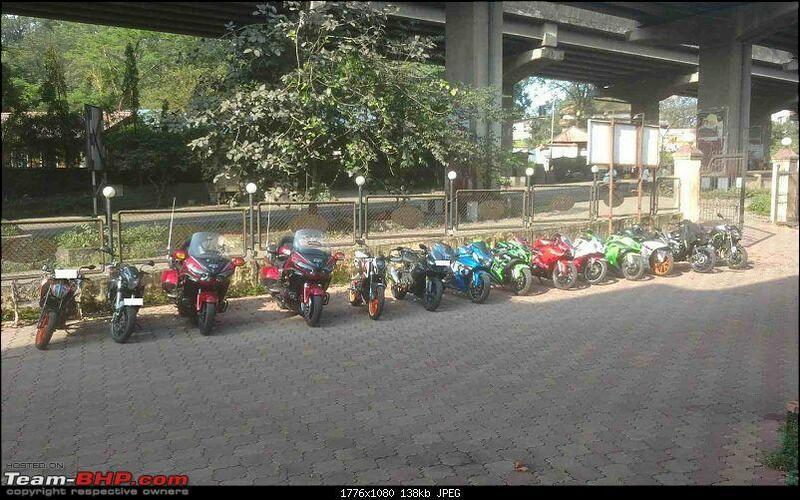 That is when I learnt that the bike would be available for purchase only through select dealerships. 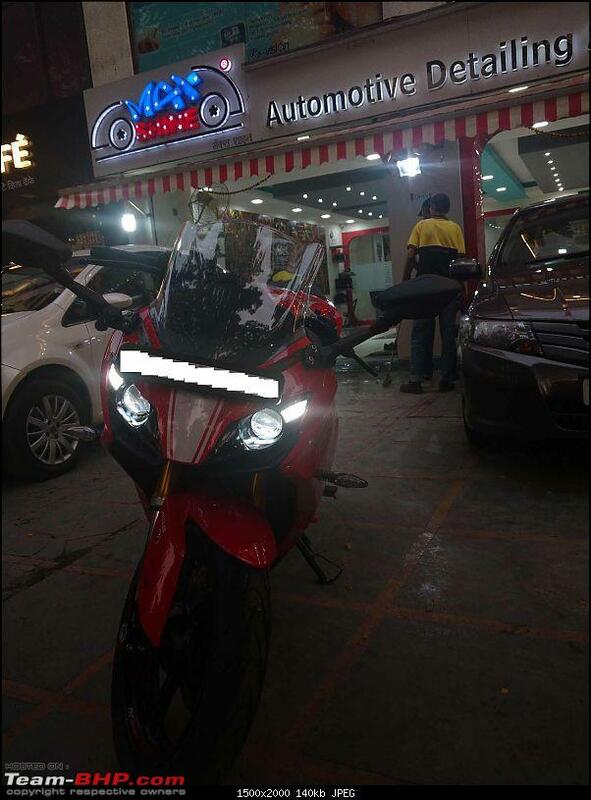 In and around Mumbai, there were only three dealerships located at Panvel, Ulhasnagar and Malad. I enquired with them for the bookings a few days post the launch and most of them were still unclear about the same. 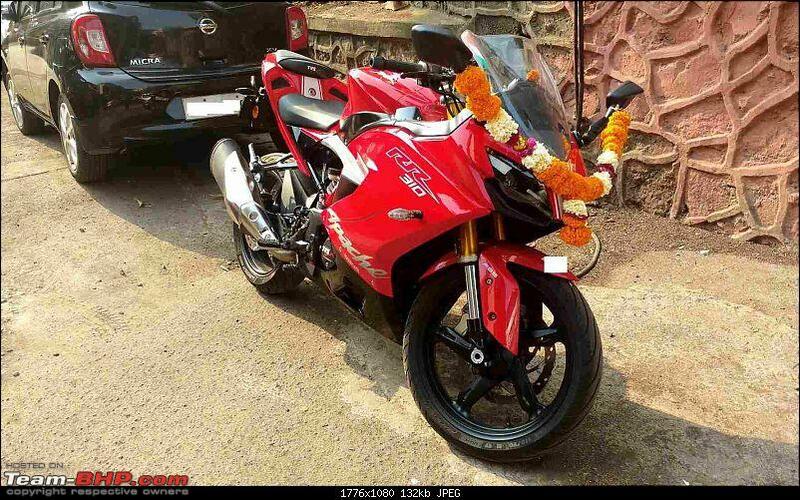 I even called the dealerships in Pune to enquire about the bookings, such was the level of enthusiasm I had for the RR310. 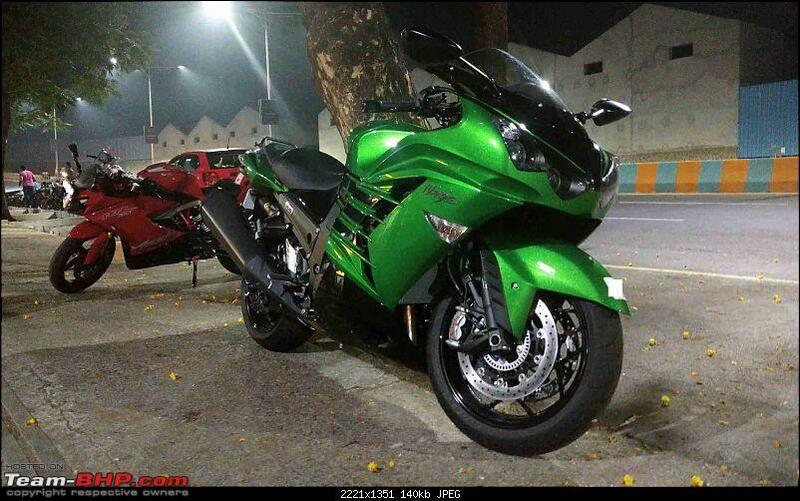 I even asked these dealerships when the TD bike would be available but they were clueless about the same. 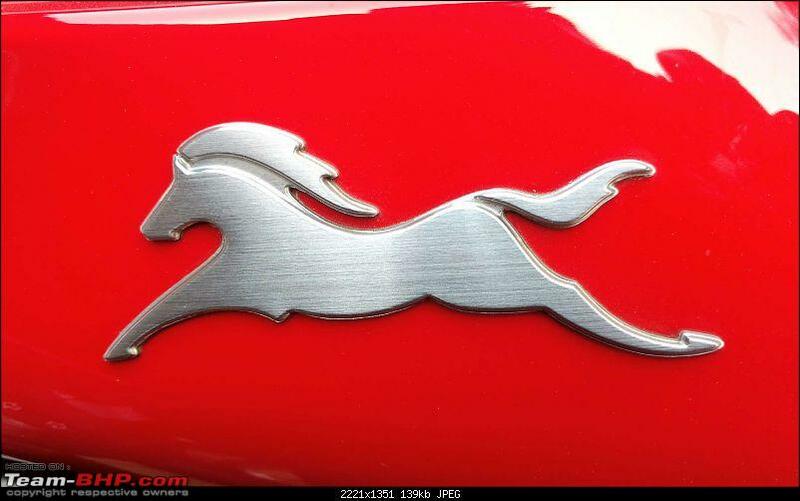 I called up all three dealerships based in Mumbai a week later. 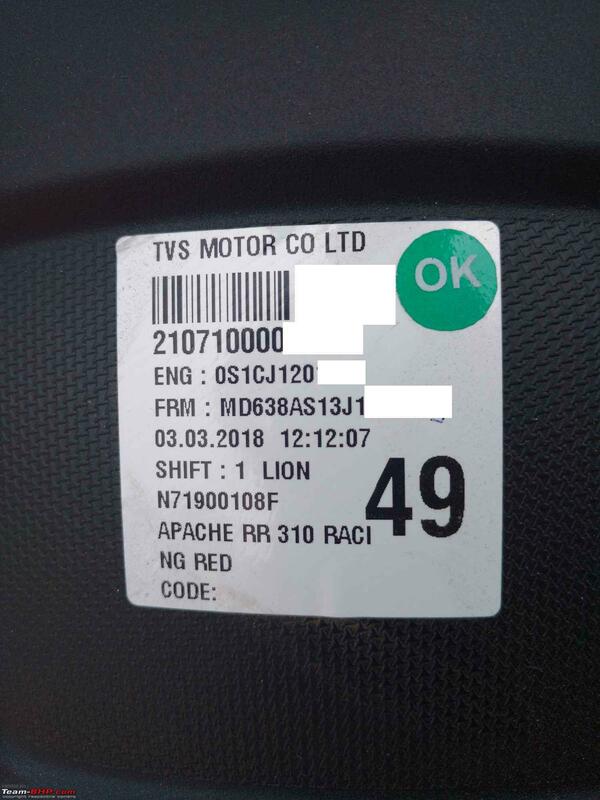 Supreme TVS (the Ulhasnagar dealer) said that bookings are being accepted and waiting for the red colour variant could stretch to 6 months while the black colour variant could be made available in about 2-3 months. Hare Krishna TVS (the Malad dealer) said bookings weren’t open at the moment and took my number promising a call back when the begin bookings. Priyanka TVS (the Panvel dealer) was very up-front regarding the details and gave me a timeline of 3 months post the date of booking irrespective of the colour choice. The guy on the call was sounding very confident in his words and hence I thought of going ahead with them. On December 20, I reach the Panvel dealership and the MD (IIRC) answers most of my questions and tells me that this is all he knows about the product till date. 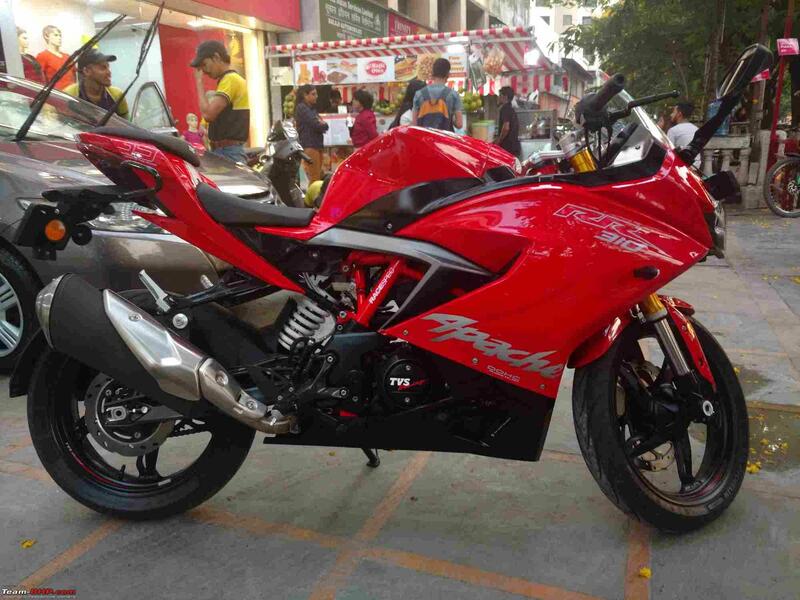 I ask him about the colour availability and he says you can get the colour of your choice within three months of booking the bike. I had gone with the cheque book and asked him what the booking amount was. INR 25,000, I was told. I double checked with him and asked him why they need such a large amount as a booking to which he replied that most people come on the basis of booking against INR 1000, test the bike (have a joy ride basically) and ask for the booking amount to be returned as they are unsatisfied with the product. I told him I had paid a mere INR 5000 booking for my Creta worth INR 11 lakh and that the INR 25k booking for the RR310 still sounded a bit too much. He wasn’t on negotiating terms, but said that in case I don’t like the bike, he would give me a full refund. Sounds fair enough, I think and put down the booking amount asked by them. He told me mine was the twelfth booking at the dealership. 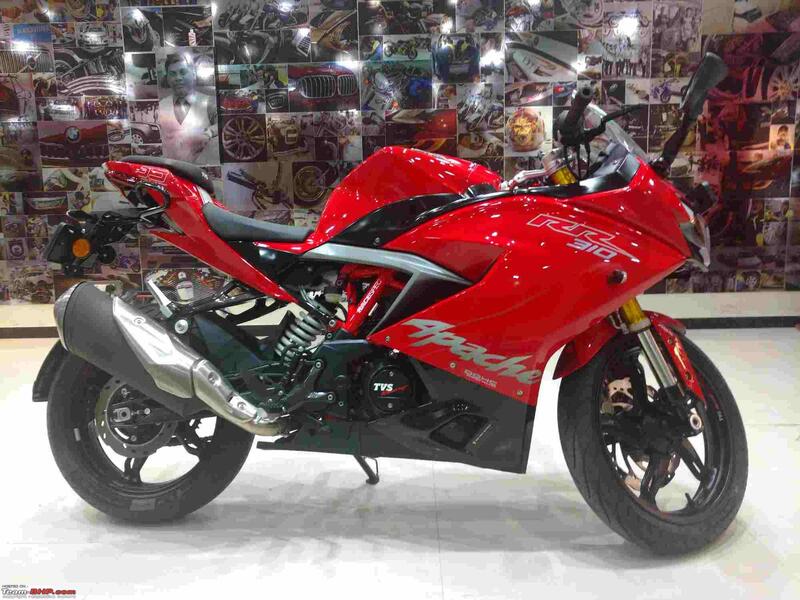 I asked my Sales Advisor (SA), Mr. Farid to keep me updated when the display bike and test drive bike arrived and he promised the same. About 10 days later I receive a call from my SA that the display bike has arrived. 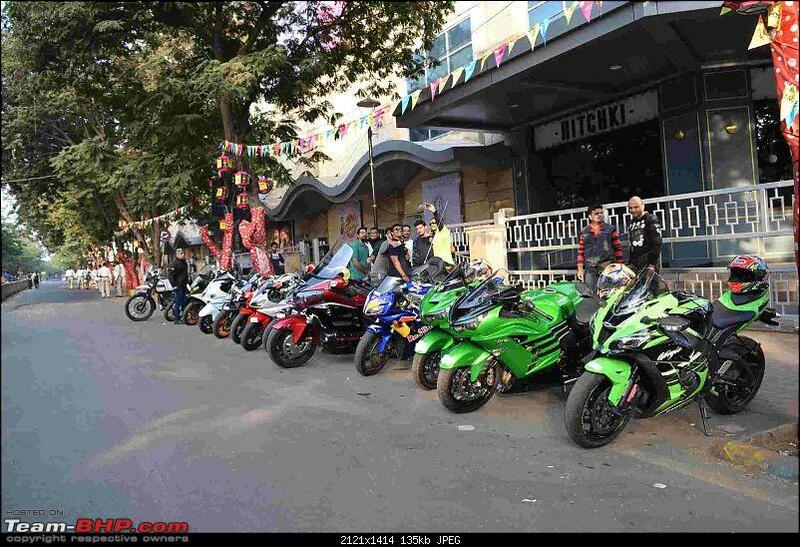 Me and a few friends of mine tag long to check out the bike. 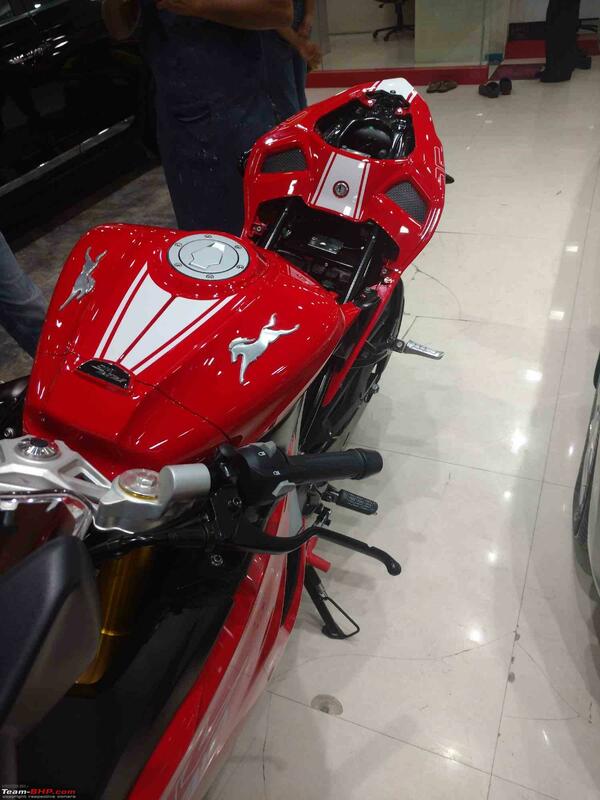 We arrive at the showroom and we see two bikes on display, one each in red and matte black. This is when I was sure I was going for the red one if at all I do plan to buy it. My heart was set on it. 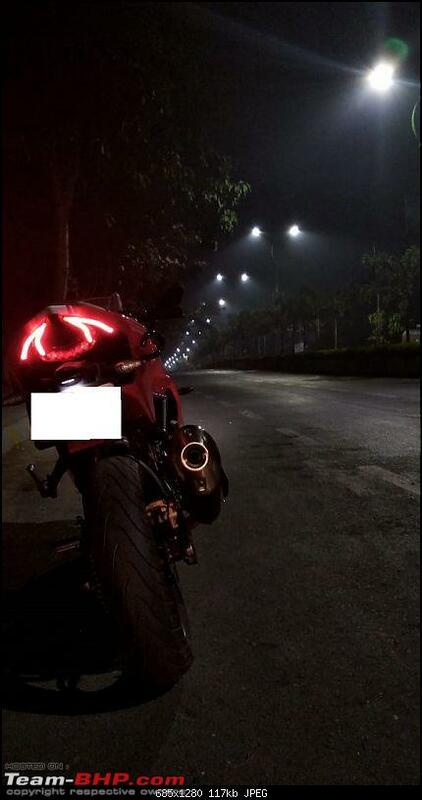 We wanted to see the instrument cluster in action and sit on the bike to get a feel of the ergonomics. 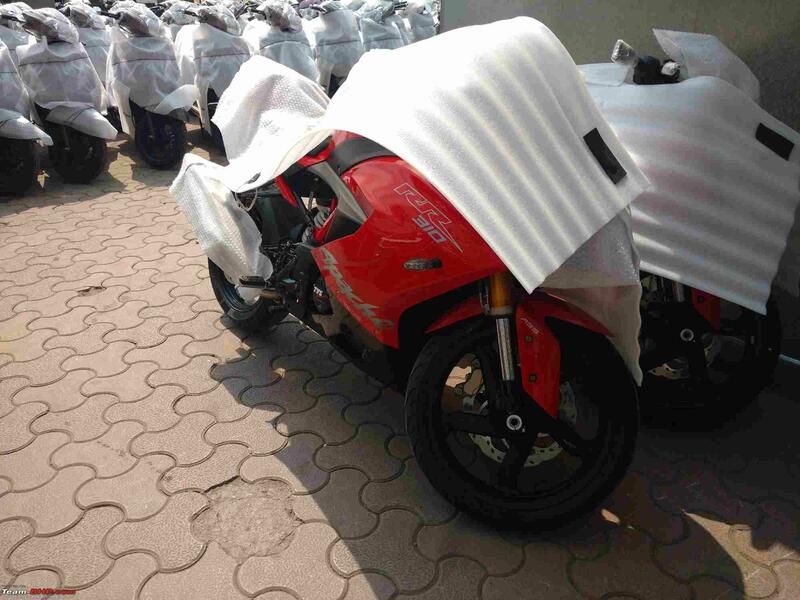 The SA declined offering either of two saying it was a display bike and hence the battery was not connected hence we can’t see the instrument cluster and we cannot sit on the bike as that unit will later be delivered to a customer after the new lot of bikes arrive. He refused to budge and asked us to talk to his boss (the MD whom I had spoken to earlier). We reasoned with the MD that a few other showrooms were allowing both the aforementioned things. 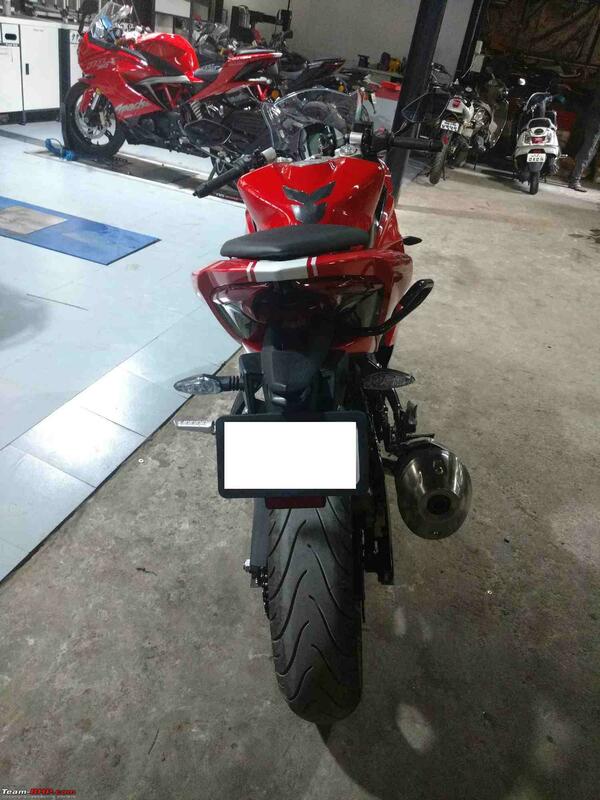 He gave in for the instrument cluster and asked for the battery to be connected but refused to let us sit on the bike citing the fact that no customer would like anyone sitting on their bike, a fact which I agreed to as even I wouldn’t like this to happen on my bike. He politely told us that we can take the TD bike for the same purpose whenever it arrives. 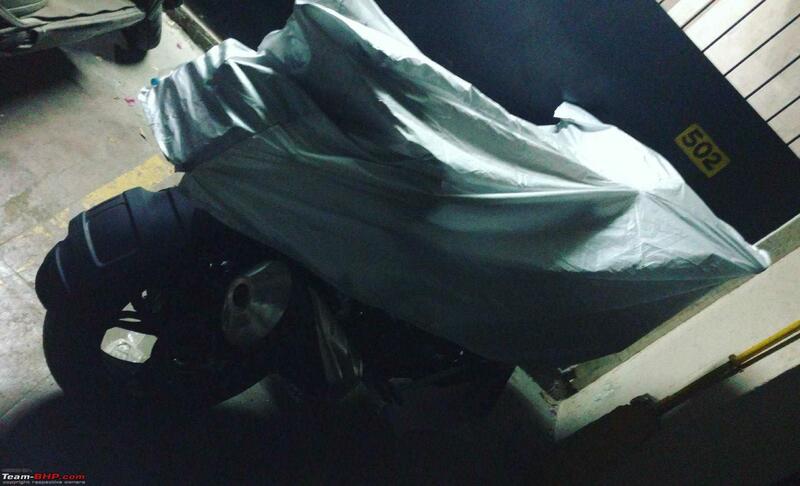 I call up my SA about 2 weeks later but there is still no update on the TD bike. I ask him what the issue is to which he responds that the company is not sending a TD vehicle and hence they are helpless. 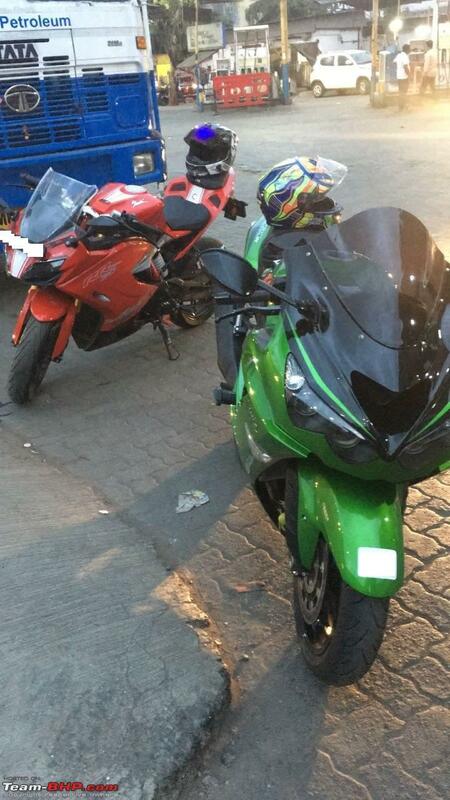 I later found out that Hare Krishna TVS in Malad had a TD bike and so called up and enquired about the same. The guy on call said it is available and I asked him if I could come the next day for the TD to which he said yes, you can. The next day, I reach the dealership after 1.5 hours of traffic, of which 45 minutes were taken in just the last 0.5 km. Patience tested, I was in no mood for anything going wrong ahead. I reached the dealership and saw the TD bike going out for a spin. I went to the reception and asked for a TD and gave a reference that I had called the previous day. They said there are already a few people lined up for the TD and hence I would have to wait a bit. No problem, as I sat down conversing with an SA regarding booking in order to kill time. I took a TD of about 3-4 kms with one of the showroom guys sitting behind me. 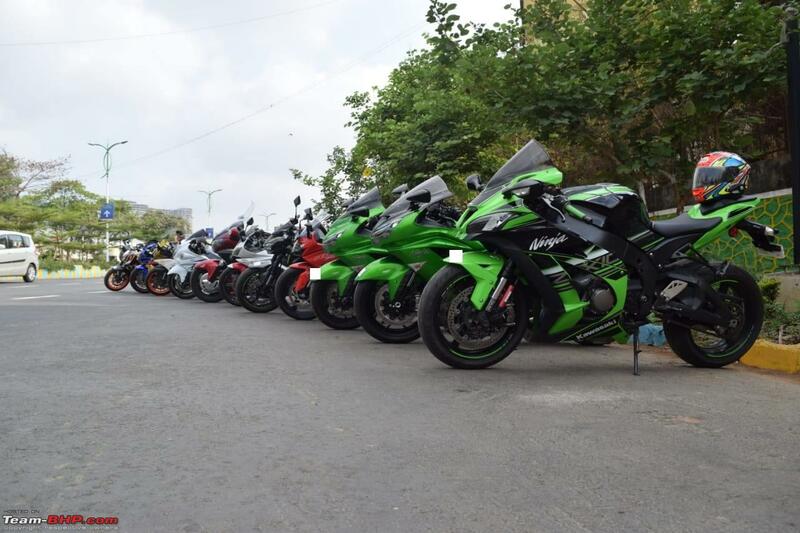 The TD bike was introduced barely a week ago and had almost done 980 kms on the odo, hinting at the kind of demand they were getting for TD’s since this was the only TD bike in the Mumbai region. There were a few vibrations, but not something that I couldn’t live with. 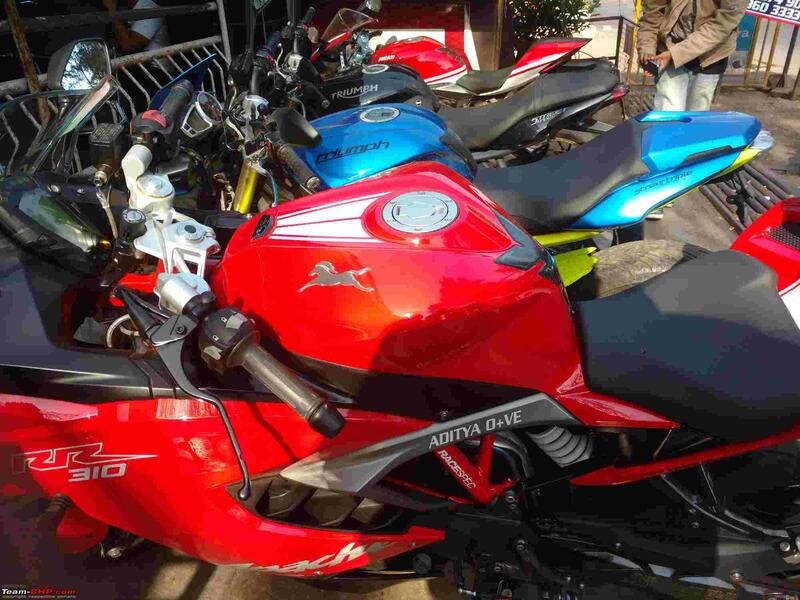 I later asked the same SA if there was any way I could get the bike earlier, he told me that they already have a waiting list of more than 120 customers even after having delivered about 12-15 units. The manager of the showroom (a lady) interrupted the conversation saying that if I wanted the bike early, I should have booked earlier. I was pretty cheesed off at the fact that they had not only begun accepting bookings, but also began deliveries and were least bothered to call me for booking even after previously having noting down my contact details. I gave her an earful on the same but she was least bothered and said if you want to book now you can go ahead, the waiting period won’t change. Pissed off with their rubbish attitude, I walked off without uttering another word. Next week, I called up the regional head for TVS in Mumbai and asked him regarding the unavailability of a TD bike at the Panvel dealership. This guy was arrogant in his attitude and said if you want; TD is available at the Malad dealership. I told him about my experience at the same dealership and he said he would look into it but there is not much that can be done. I had also shot a mail to TVS Motor Company after the attitude shown by one of their ‘premium dealerships’ chosen to sell the RR310 acted so arrogantly as well. There was no response for the mail and I asked him about the same to which he didn’t have any reply. Before keeping the call, I asked him why TVS is acting like this by not giving a TD bike to certain dealerships, no brochure available at any dealer and no details regarding accessories like a paddock stand. He said he would find out and get back to me. FYI, I haven’t received the claimed ‘call back’ till date. 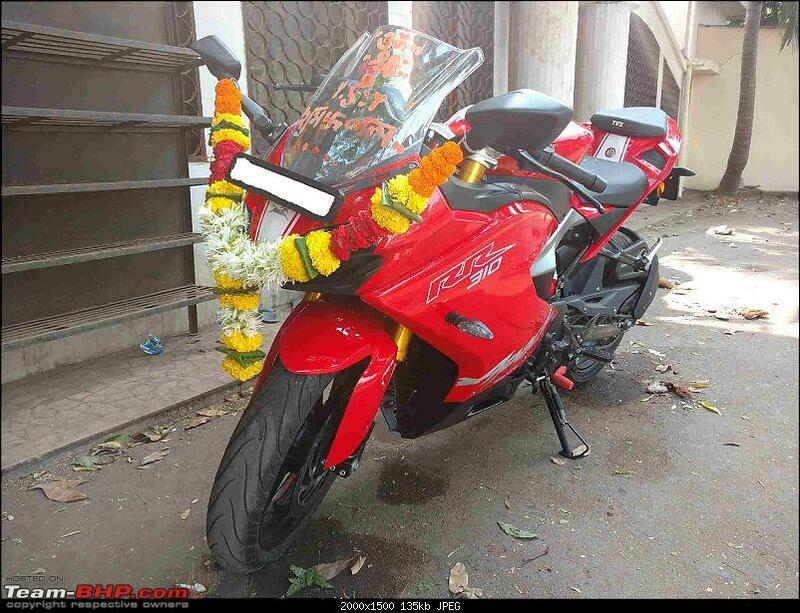 A month passed by and in January, I saw a few videos where the Panvel dealership had begun delivering the bikes. 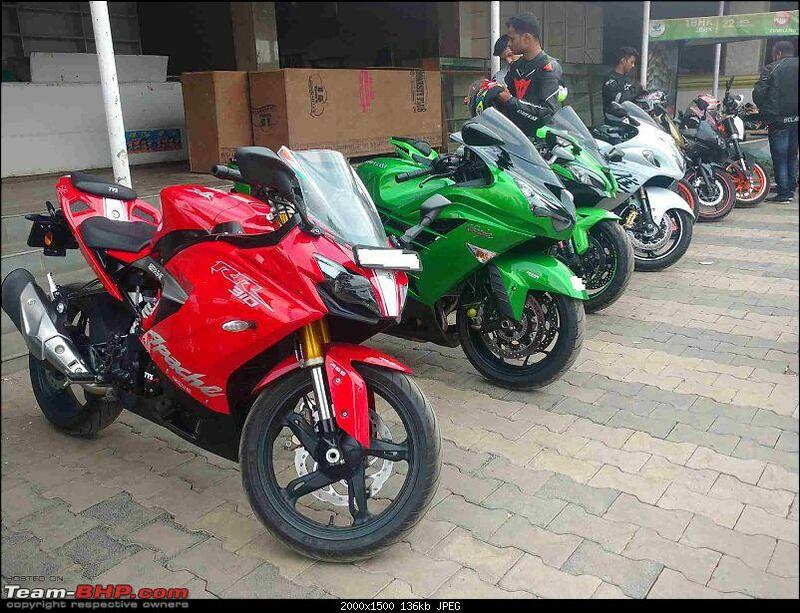 Since I was in the area the same day, I dropped in at the showroom and had a word with the MD (still not sure about his designation) which is when he revealed that he doesn’t have the moolah to invest in a TD bike as the company doesn’t provide one. Seriously? I mean this guy owns two showrooms, including a three floor showroom/stockyard at Panvel. I am also shocked as well as a little surprised that he honestly told me the real deal instead of just giving lame reasons. After a little discussion in detail, we leave for the day and I tell him I’ll be back when my bike arrives. It’s the second week of March and I get a call from my SA around 10.30 AM that the bike has arrived. I’m jumping in joy and excitement that she’s finally here. Only a few more days until she comes home now! The SA asks me to pay the balance amount. 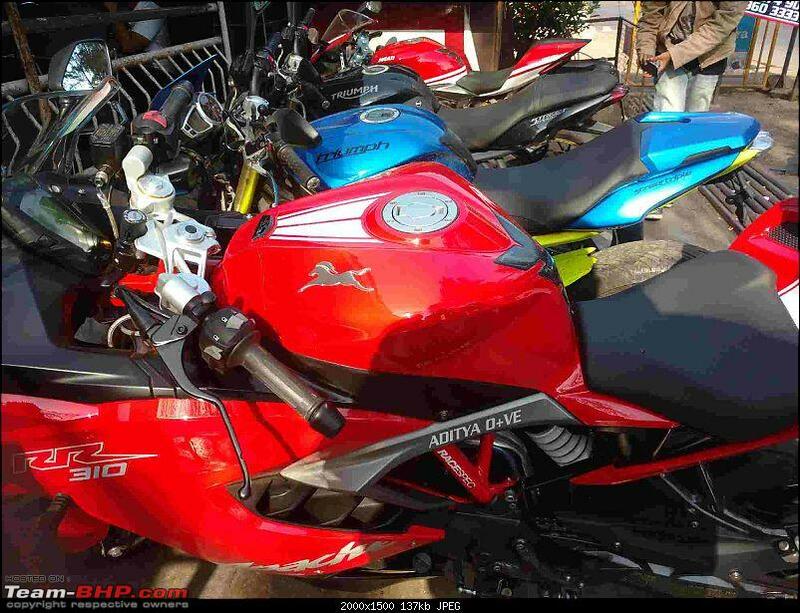 I tell him I’ll come to see the bike the next day, do the PDI and they pay the balance amount. 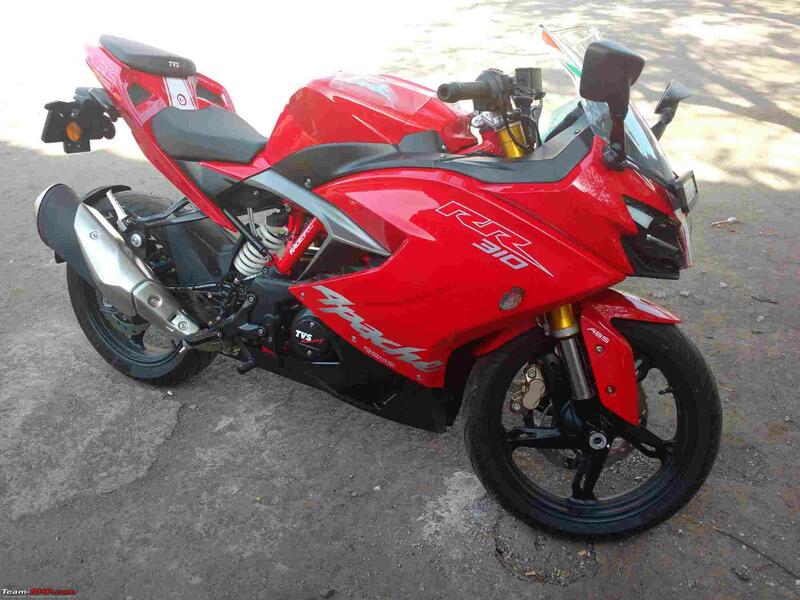 He politely agrees and I reach the next day, finish the PDI (no issues here, courtesy of Team-BHP PDI check-list) and ask him if I can take the owner’s manual home to read it so I know a little about the bike before taking delivery. He is hesitant and asks me to talk to his boss again. We go to the boss’s cabin where he has arranged some tea and snacks for us. He readily agrees that I can take the manual home. I ask him if there is anything else that needs to be cleared, doubt or money, as I don’t want any problem at the time of delivery. He asks my SA if he has told me about the number plate. I am clueless and ask him what the issue is to which the SA replies that they do not provide a number/registration plate for the RR310. What? How is that even legal? A few of my friends who have accompanied me and have good knowledge in this field argue that this is not possible. 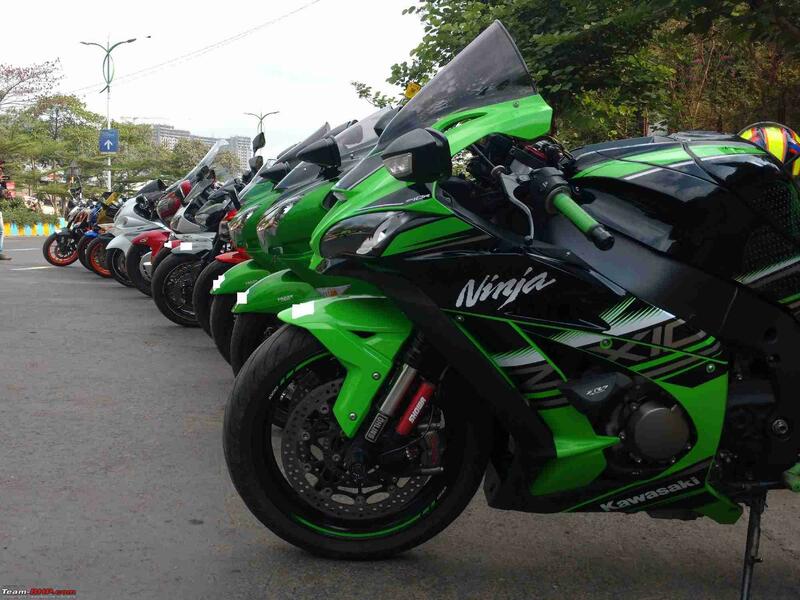 He (my friend) reiterates that his Kawasaki Ninja, which is a CBU, comes with company fitted number plate and we cannot and won’t accept the bike without the same. 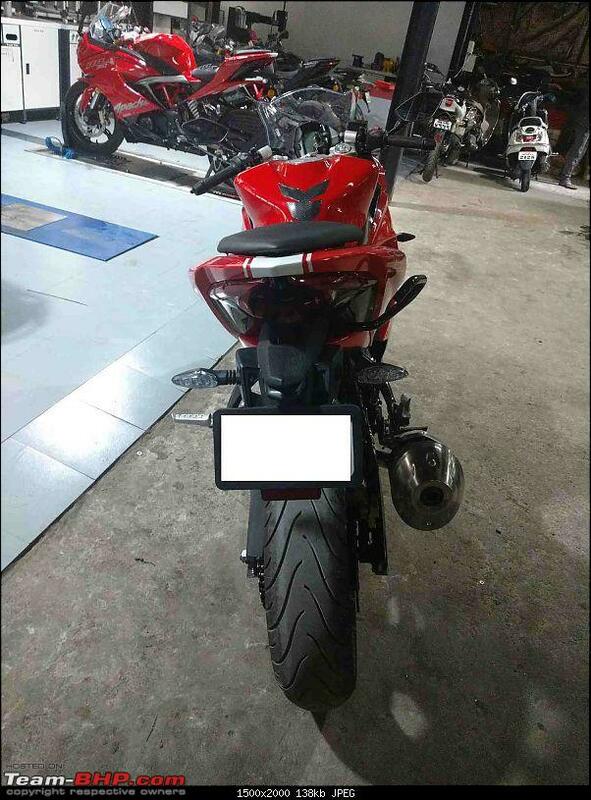 My SA tries reasoning that the number plates they use for all other two wheelers sold from their showroom do not fit the RR310. We request him to present the same on the day of delivery and we will have it fixed on our own if the need be, but we won’t be paying a penny for the number plate separately. They finally agree and we call it a day. 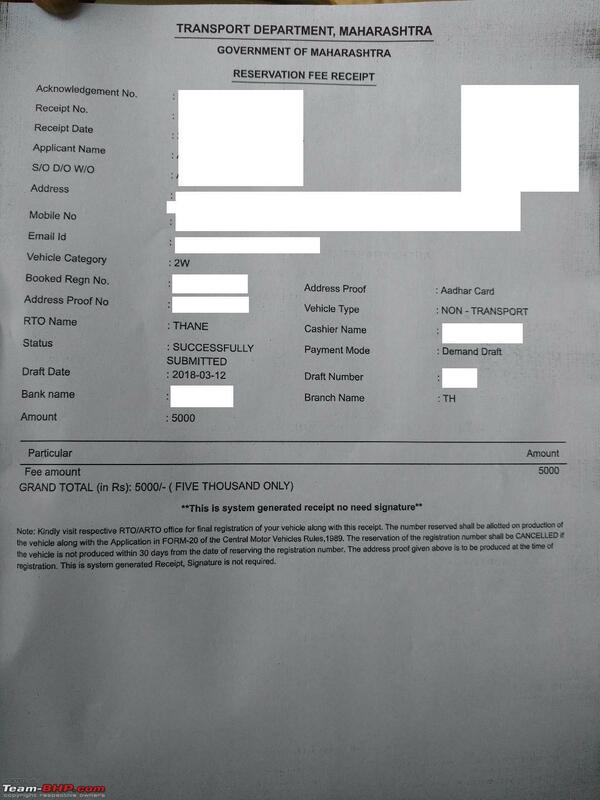 The next day, I transfer the balance payment and ask him if he can get the registration done from the Thane RTO by himself. 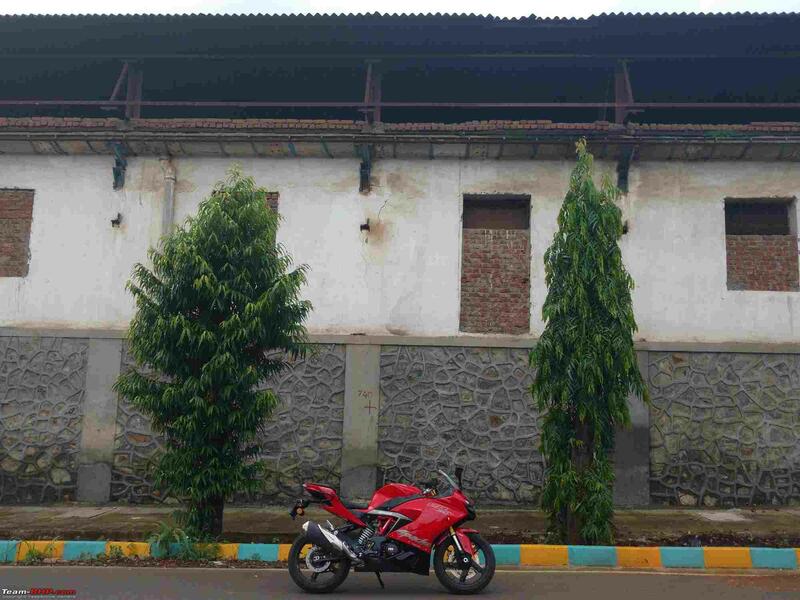 He says it can be done without even needing to take the bike to the RTO. 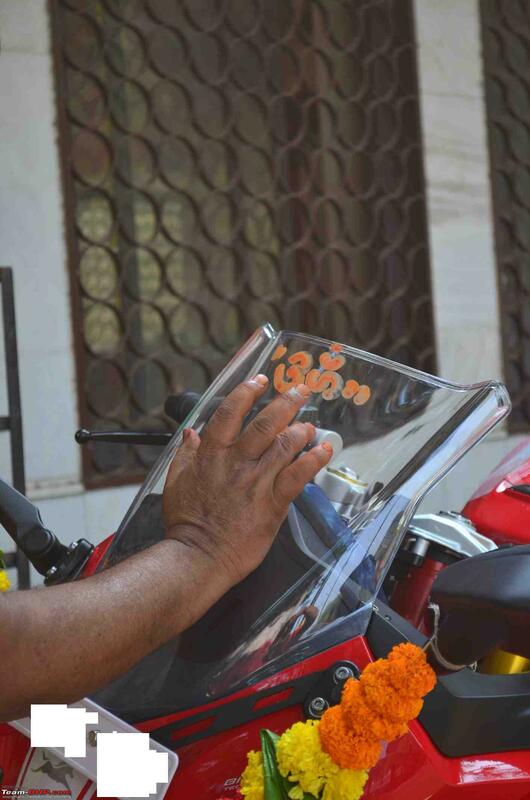 Strange, I wonder, as the RTO usually warrants that the bike/car be present during registration. I tell him I want a special number and will get it done myself and send him the receipt of the same in the next few days. The Thane RTO claims to have made special number booking an online process where one has to log on to parivahan.gov.in and see the availability of his choice of number. 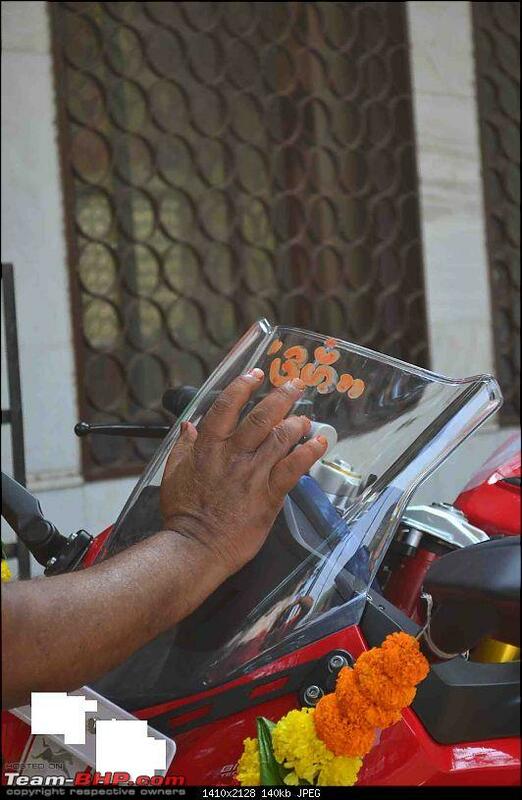 Once available, you can go to the RTO with a DD in the name of ‘RTO Thane’ with the amount given against your choice of number. 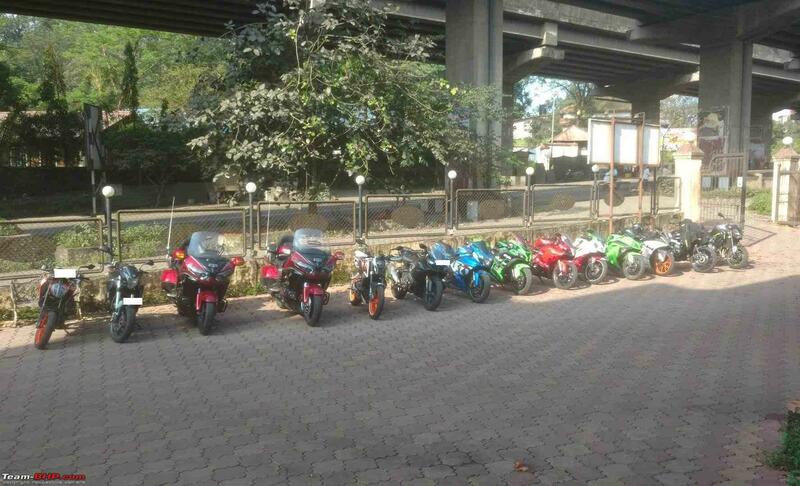 Once at the Thane RTO (located near central jail), you have to fill a form and go to window no. 24 (could have changed by now) and re-check with the guy sitting at the counter if the number is still available as the website is updated only once a day. The person sitting at the counter will check, and if the number in question is available, he will write your details against this choice number, fill a few details such as the number of choice in the form and then ask you to get the form signed from a higher-up. 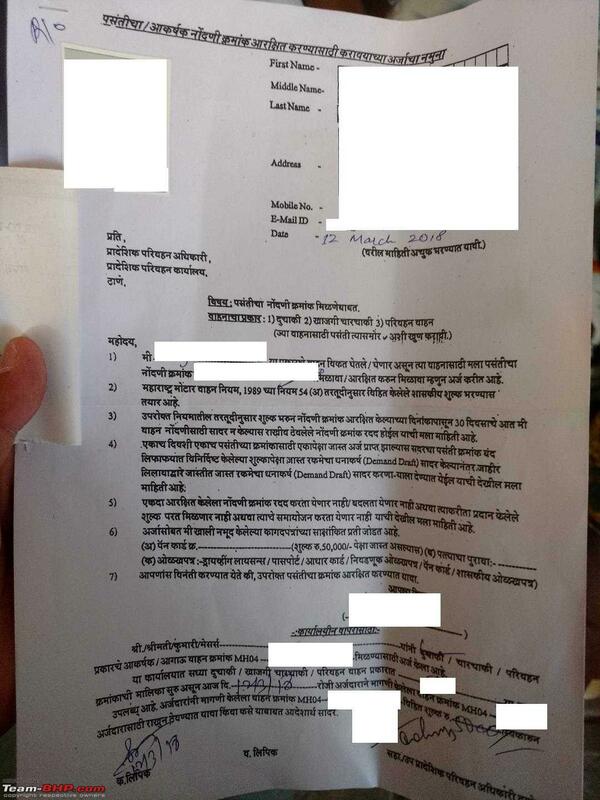 This officer/RTO inspector is inside his cabin only for a few hours every working day, hence make sure you know the timing because if you miss getting his signature on the form, you will end up wasting another day at the RTO. Once inside this official’s cabin, he might or might not ask you a question or two like why this number, which vehicle etc. 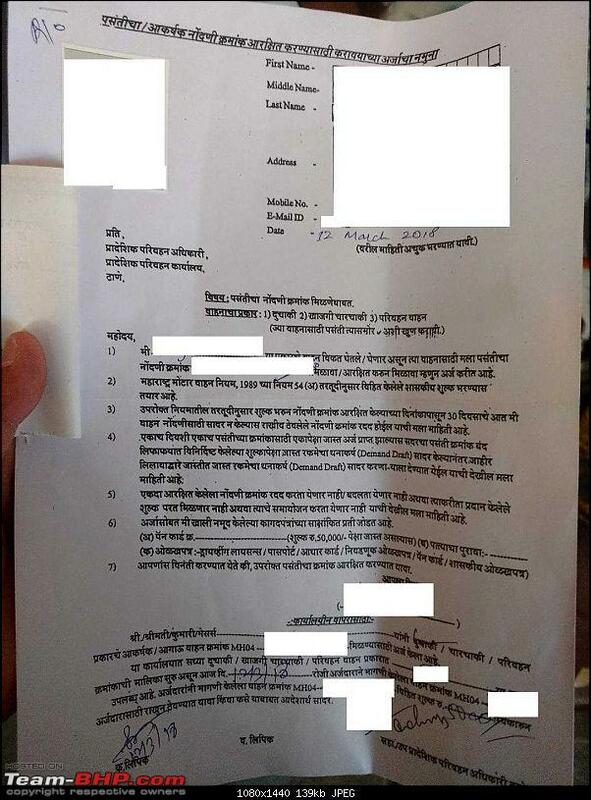 Once this form is signed by the official, you have to take the form and the stapled DD to another counter below his office which will fill in the details on the main server and register the number against your name (valid for 30 days). 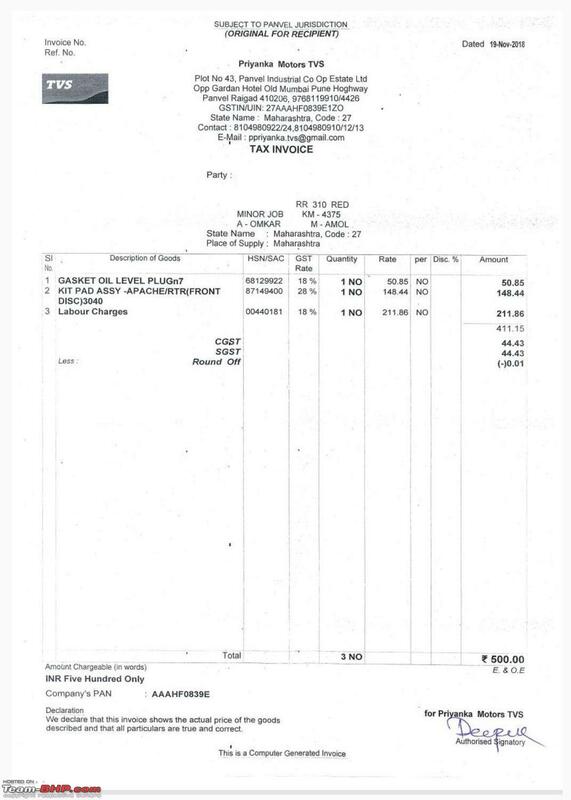 They will issue you a receipt which you have to share with your dealer prior to the registration. The process, though a bit confusing, was quite smooth and I didn’t feel any agent/tout could have got it done faster or in a better way. After sharing the special number receipt with my SA, he acknowledged receiving the balance payment and asked when I would like delivery. I thought of surprising my parents since they were unaware that the bike would come so soon. 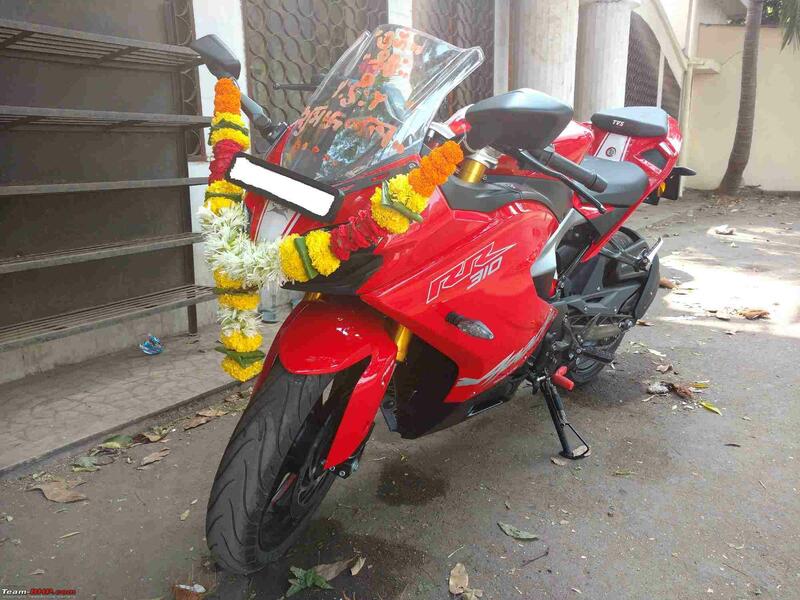 I asked him to keep the bike ready for delivery on 18th March due to two reasons: (A) It was a week away, giving him enough time to complete the formalities and (B) it was an auspicious day being Gudi Padwa. The night before the delivery, which was to take place on Sunday, I told my parents that we were supposed to go to Panvel the next day to take delivery of my bike. Mom was pretty excited while dad was surprised that the dealer actually kept his word of delivering the bike in 3 months. The delivery time is set for 11 AM and we depart from home at around 8.30 AM, leaving a bit early just in case there is traffic on the way. We reach the showroom by 10 AM and witness the chaos (for the lack of a better word) that sets in during an auspicious day where hundreds of deliveries are scheduled. I go and greet my SA and ask him if everything is ready. He confirms the same and asks us to get the paperwork finished before going ahead with the delivery. 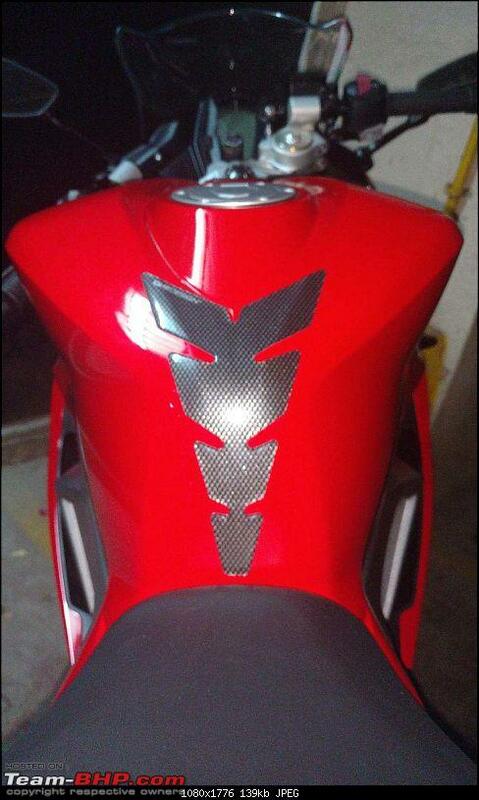 We do the necessary paperwork, I check the bike for any untoward marks before delivery again and all is fine. We go ahead with the mandatory photo session where a big cardboard cutout of a key is handed over, with the real set of keys handed over shortly after. A few close friends who had accompanied me take a few photos of me posing on the new bike with my parents and later my father takes a few photos of me on the bike with friends posing on the side. One of the service advisors comes and explains all the features of the motorcycle to me. I ask him a few questions which he promptly replies to. We later distribute sweets in the showroom before leaving. The bike had about a litre or two of fuel and I tanked up at the fuel pump which was barely 500 metres ahead. After dropping off a friend mid way, we go straight to one of my favourite temples in Thane where my lady in red receives the blessings of the almighty. We later come home and find granny waiting down to see the new beauty which has been added to the garage. As it was a new launch, there were no discounts whatsoever. 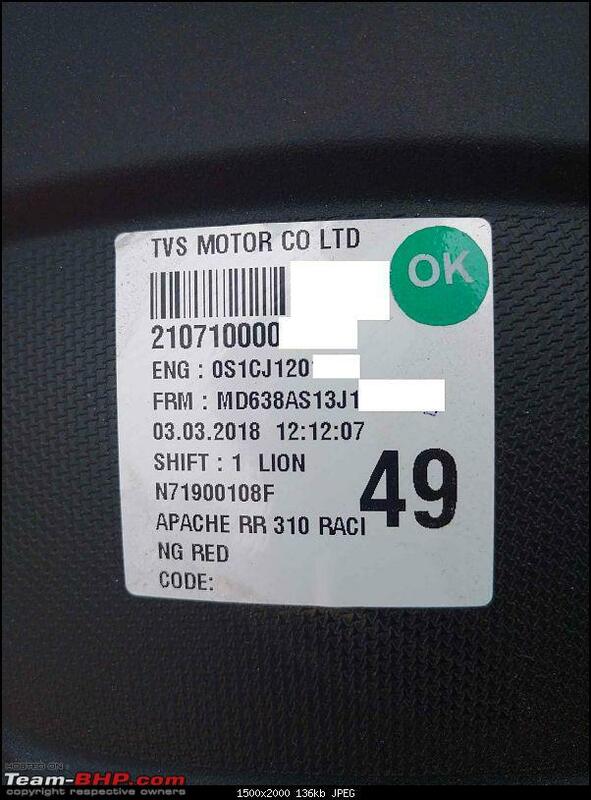 AFAIK, TVS Motor Company has not offered any extended warranty. 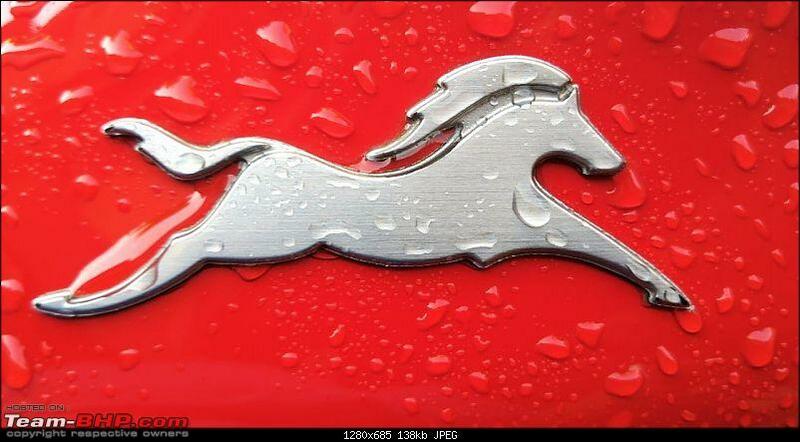 The standard warranty is for 2 years or 30,000 kms (whichever is earlier). The ASC’s have begun offering AMC’s although I’m least interested in them as they are usually a rip-off. 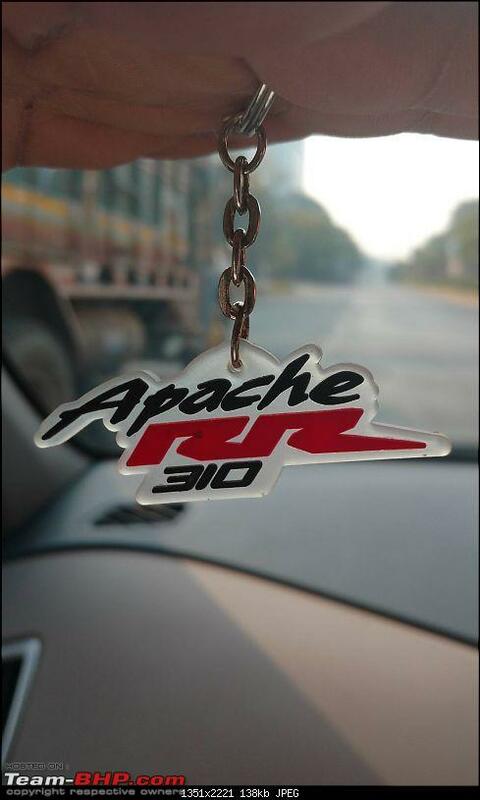 The Apache RR310 comes equipped with dual channel ABS as a standard feature. 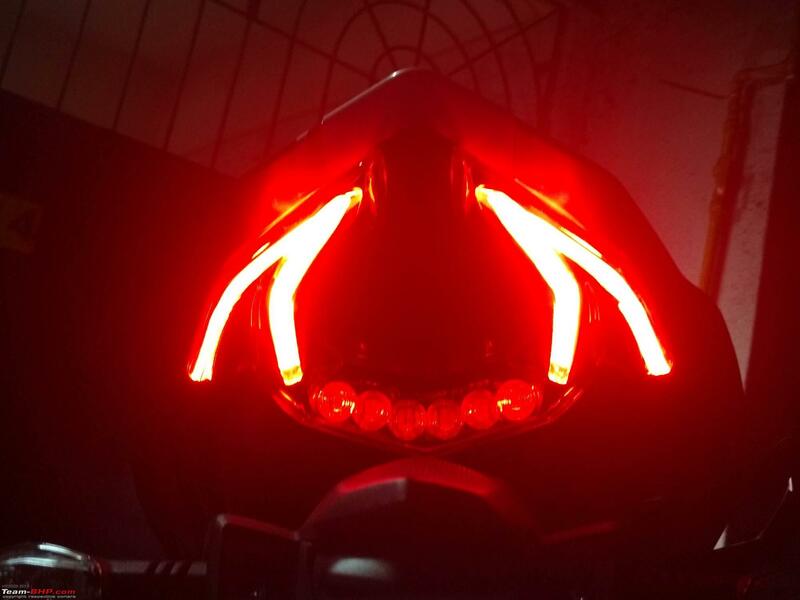 Another safety feature is that the bike automatically switches off the engine if your side stand is in position and you put the motorcycle in gear (Note: The engine will not be cut off if the stand is in position and the gear lever is in neutral). 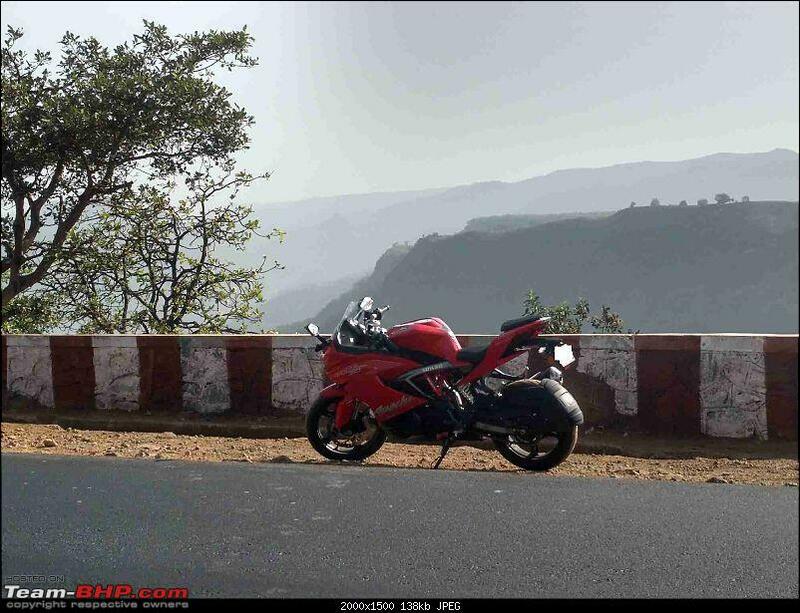 The odo on my Apache RR310 currently stands at 4644 kms at the time of writing this review. As I currently work from home, there is no daily commute I make. The occasional trip to office is a distance of 20 kms (round trip) and otherwise, the bike is used for local chores and leisure rides about every alternate day if not every day. An absolutely eye-catching design! Full marks to TVS in the design department. I have had a few seasoned riders who I met during breakfast rides asking me if this is an in-line-four bike! The attention magnet that she was in the first few months made it difficult for me to park her in public places without having to constantly tell people to not sit and fiddle with the bike. 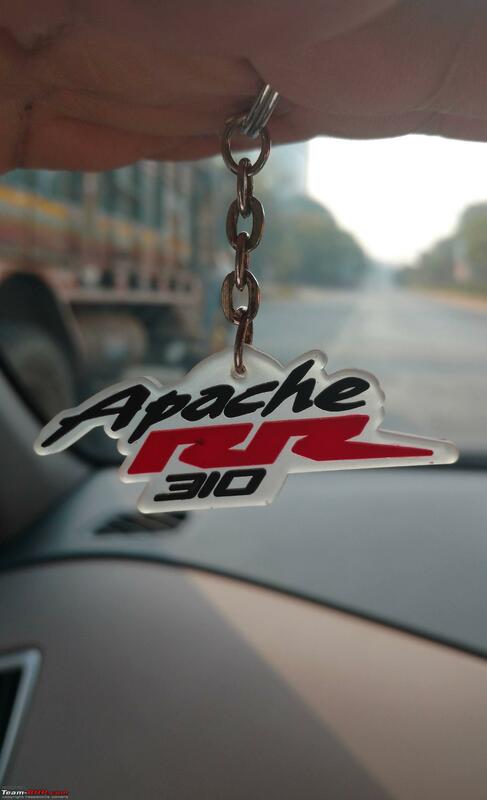 This has to be one of the very drawbacks of the Apache RR310. Initially the build quality felt built to last, but with the passing months I have noticed a few issues. The panels have begun to make a squeaking noise when pulling out of a parking and there are a few inconsistent panel gaps around the fuel tank as well. 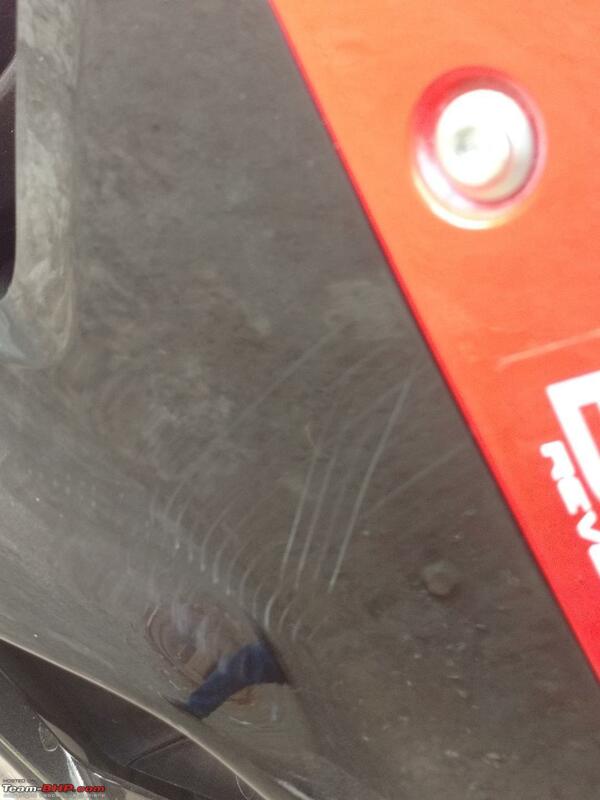 The paint on the rear (passenger) foot pegs, as I mentioned earlier, have started to fade away. 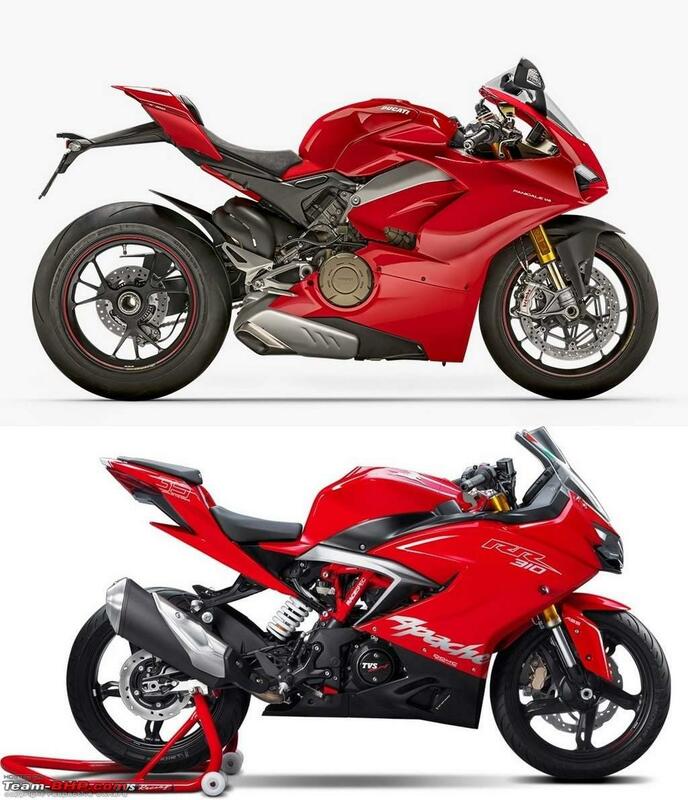 It is difficult to comment on the paint quality of the red colour as I have got the bike ceramic coated while a touch-up (or curing as it is called) is scheduled every 6 months. 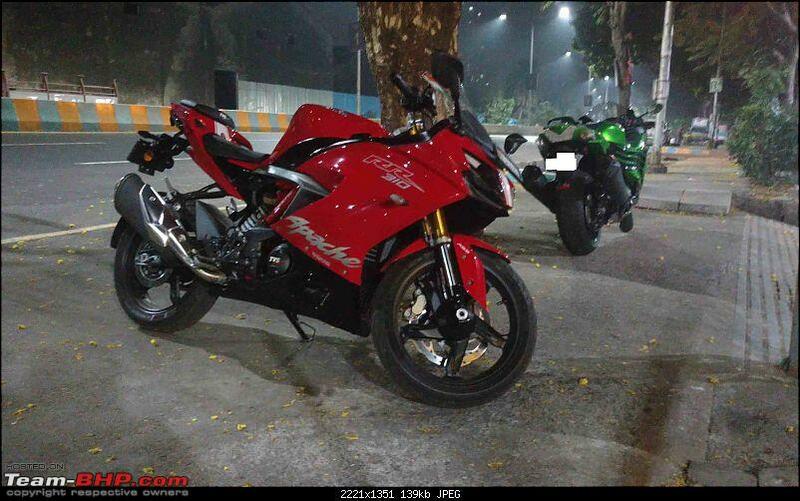 The Apache RR310 comes with 17 inch alloy wheels at the front and rear, wrapped in Michelin Pilot Street tyres. I had faced a puncture in the rear tyre two months into buying the bike, but no such issues post that. The 17 inch alloy wheels (a first in the garage as all the cars sport steel wheels) are finished with a matte black paintjob, which is cool but technically looks a bit dirty after some time, no matter how often you clean them. 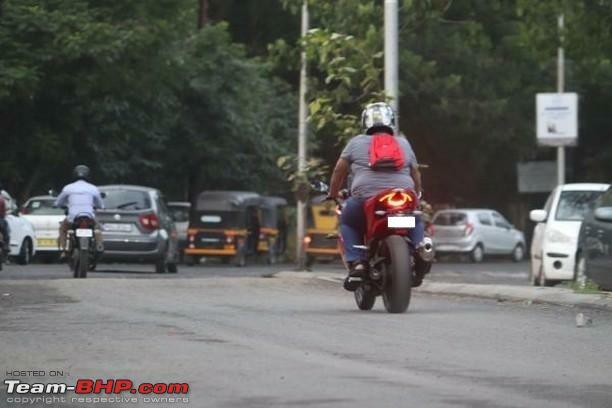 The tyres seem to be a perfect match for the motorcycle and give adequate grip on the road as well as in the corners (the few of which I went through). 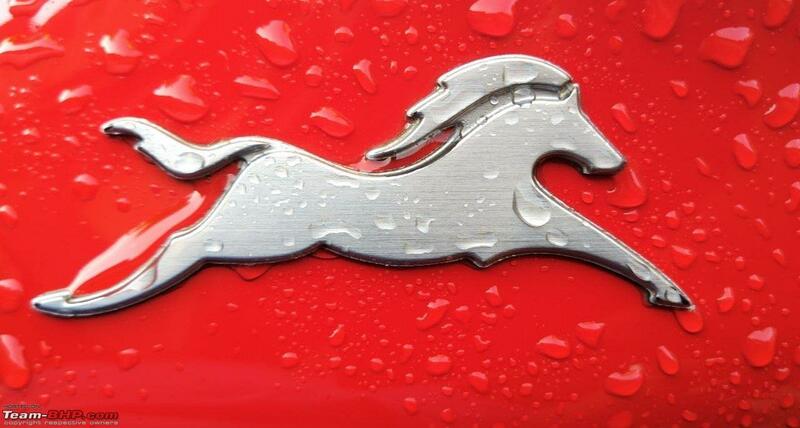 They inspire confidence in the rider to go further, unlike a few other brands. 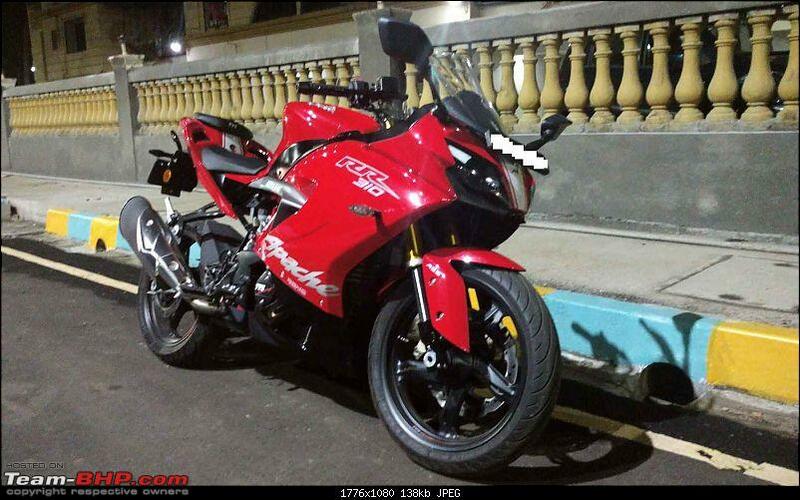 Being a fairly sport/track oriented motorcycle, the Apache RR310 does have a little front biased riding position. 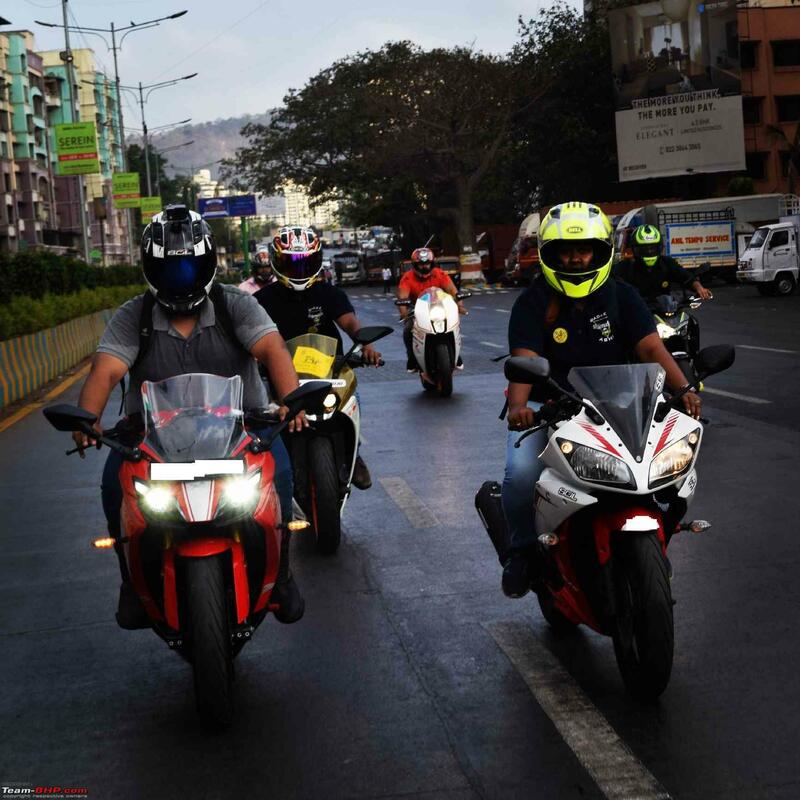 While your hands are not stretched ahead too much or too low while grabbing the handle bar, the foot pegs are a bit rear set when compared to a regular motorcycle. 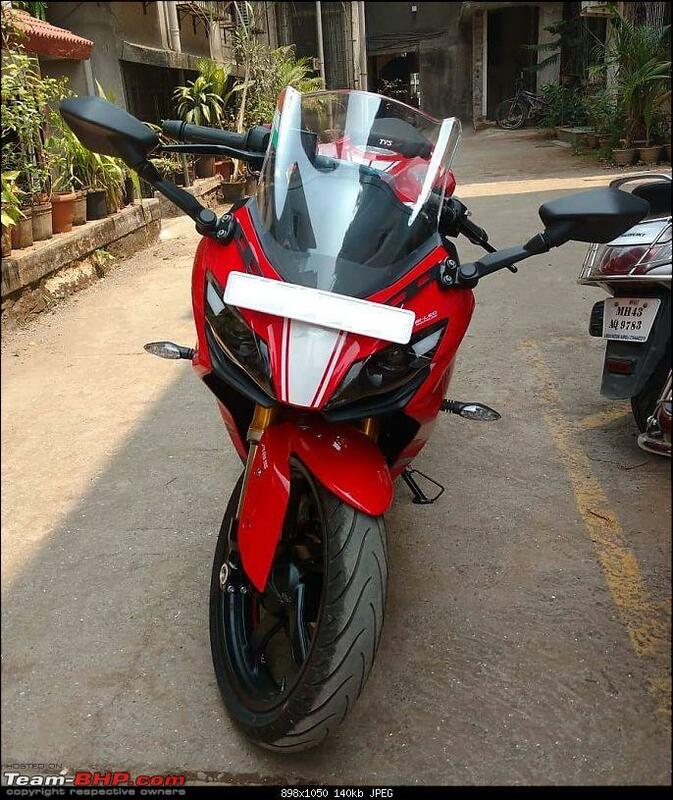 The seat height is perfect and will suit a majority of people (Indians) riding the bike. The rider seat too is quite long and leaves me a good amount of space to ahead or behind even after considering my heavy build. The size of the mirrors are just about perfect and they offer a good visibility of the rear view. The issue with them is that their stalks or rods holding the mirror (for the lack of a better word) that are a bit too wide. They can become a pain while negotiating through traffic and I have ended up getting a few scratches on the same due to this. 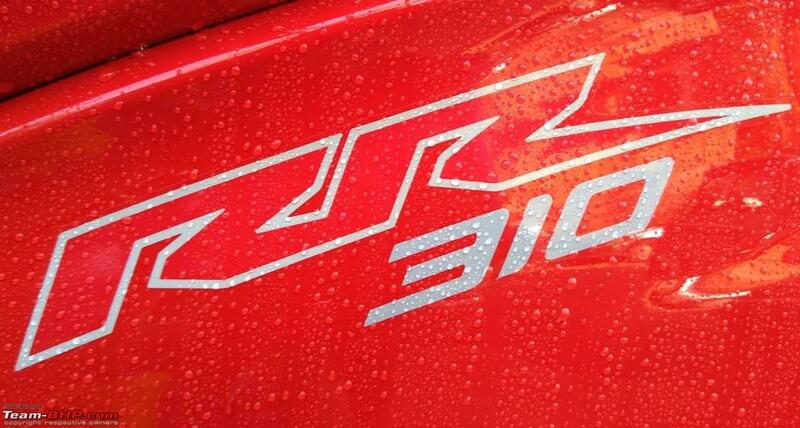 The engine powering the RR310 feels more than adequate for the city commutes. You can easily go up to 60 kmph in fourth gear without lugging the engine. One thing that could be an irritation to a few would be the constant switching on and off of the fan due to the rising temperature in the engine and it’s surroundings. 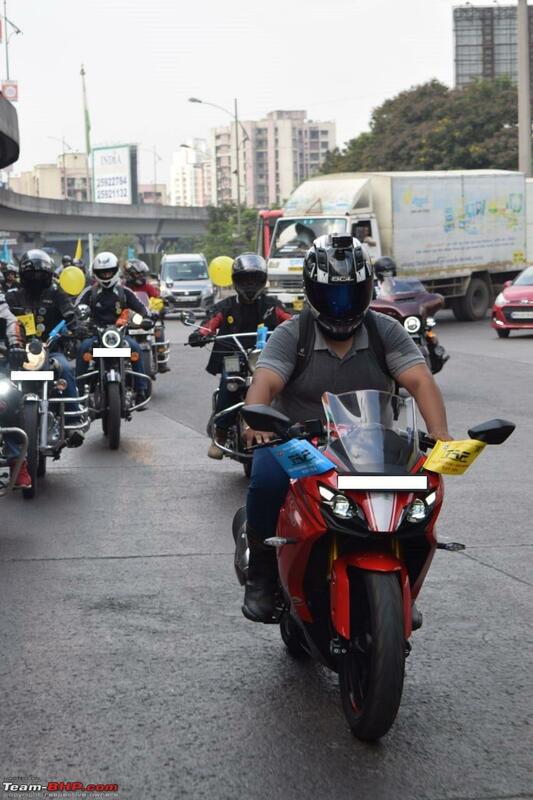 The Apache feels at home on the highway and can do triple digits the whole day without a sweat. The only issue you might encounter is the vibrations on the handlebar at speeds of around 100 kmph. TVS has apparently found a solution to this by replacing the stock bar-end weights with heavier units. I recently acquired them FOC from the ASC and got them fitted. I could immediately feel the difference as the vibrations had reduced though I am yet to test it at 100 kmph, where the actual problem exists. Oh boy! Does she love being revved. She may not be as revv-happy or revv-friendly as the Austrian rivals, but she demands to be pushed to the end of the revv limiter (not that I do it often). While the power feels sufficient, I feel there should have been more torque for a better acceleration (just a want, not a complaint). The refinement of this engine is pretty good. Compared to my previous bike, the Avenger 220, the RR310 does not have any vibrations near the fuel tank or on the foot pegs, absolutely nothing, at least up to approximately 8,000 rpm. Agreed it could have been more refined, but hey, it’s a single cylinder motor after all and there’s only so much one can do. I’ll be glad to accept her as she is. I love the tractability and the low end torque of this engine. 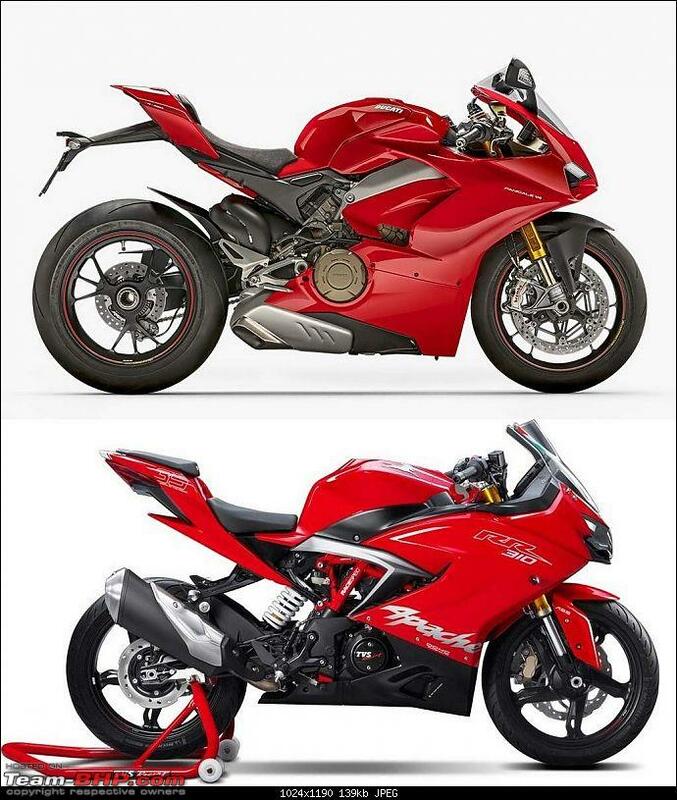 There is always room for improvement but I guess TVS and BMW have done the best they could in the refinement department. 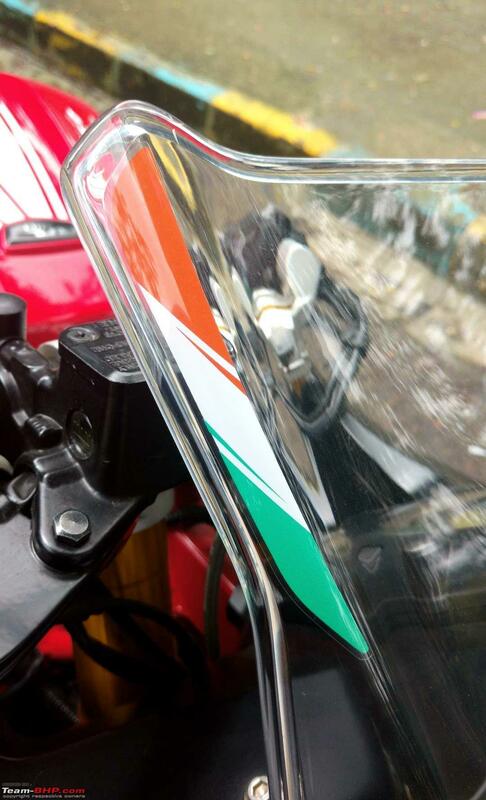 Nonetheless, if I had to say it, I would have loved lesser vibrations on the handle bar at speeds of 100 kmph right after taking possession of my vehicle, not a few months and numerous complaints from owners later. Put the bike into the 1st gear, and you can hear the type of clunk that one usually hears when an SBK shifts from neutral to first gear. Sometimes I like this while sometimes, I just don’t. There was initially the issue of not being able to find neutral but I guess I’ve got used to it by now and hence don’t consider it as a problem anymore. The play of the clutch lever is too loose and ends up touching the bar ends or handle bar almost every time and this becomes irritating whenever you notice it. The clutch lever also seems to be a bit loose and vibrates like crazy during higher rpms. The NVH levels are quite satisfactory to my liking and I haven’t had much of a problem save for those squeaky panels when taking the bike out of a parking spot and the constant vibes once the bike crosses the 8,000 rpm mark. 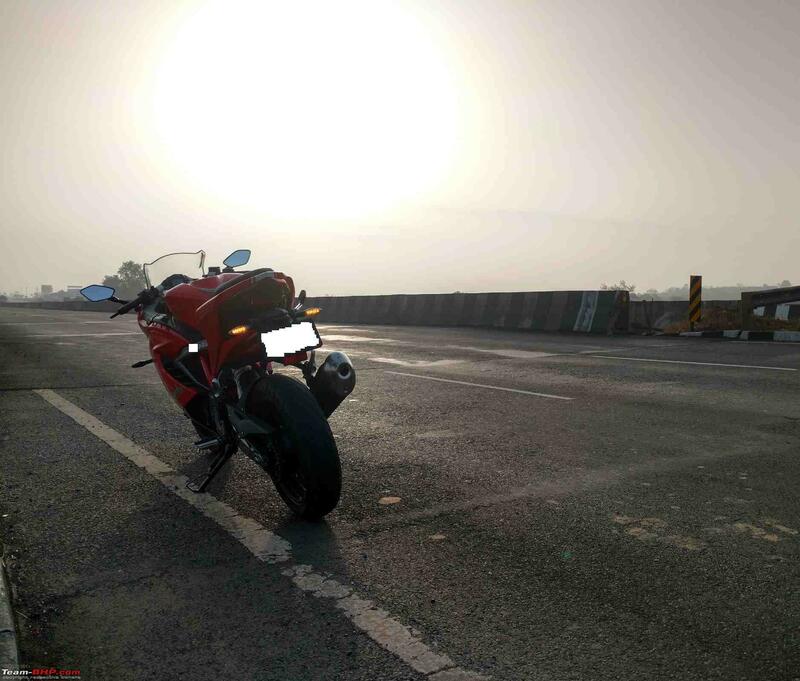 I’ve been riding the RR310 for almost 9 months now and having ridden it with different riding styles a lot of times, I can say that the bike returns a fuel efficiency of approximately 30 kmpl in the city and about 35-40 kmpl on the highway (the latter based on how much spirited riding you do in the whole trip). Something that I have noticed though is that the average mileage seen in the display never crosses 27 kmpl, no matter how sanely I ride the bike. I fuelled up a tank full of petrol on the night of 1st December, 2018. I take a leisure ride of about 10 kms before calling it a day and the display shows a range of 280 kms. Next three days I don’t use the bike as I’m busy with office related work and chores at home. I take her out 4 days after fuelling her and the range displayed is 285 kms (yes, the fuel has settled in one place over a period of 4 day hence the increased range). The next day, I go about 10 kms (one-side) to visit a relative, the majority of this journey running on a highway. I come back after a round trip of 35 odd kms (detours and a few other household chores included) and park the bike for another day. 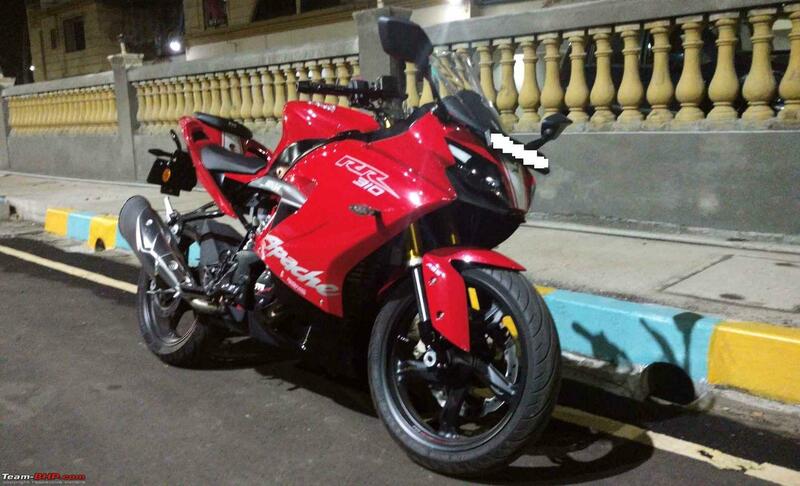 Today I take her out for a spin of about 12 kms and park her back for the night. 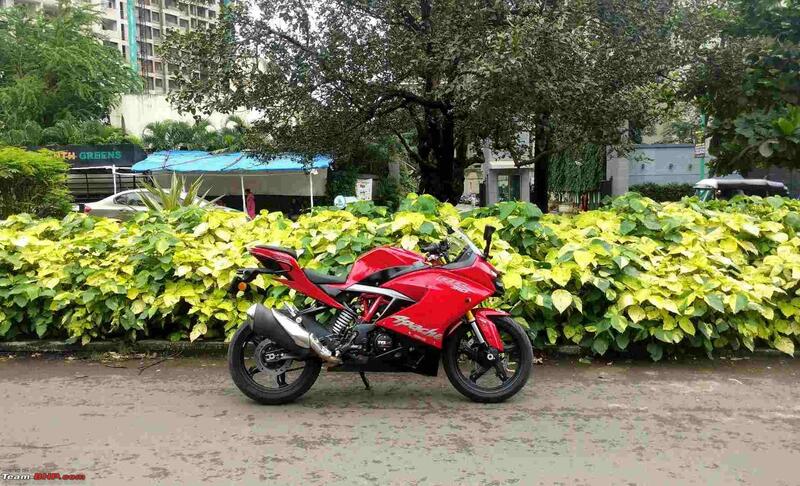 And guess what, she shows me a range of 290 kms after having used the bike for 60 kms since the time I’ve fuelled up. I’m still pondering over this confusion as I pen down the review. 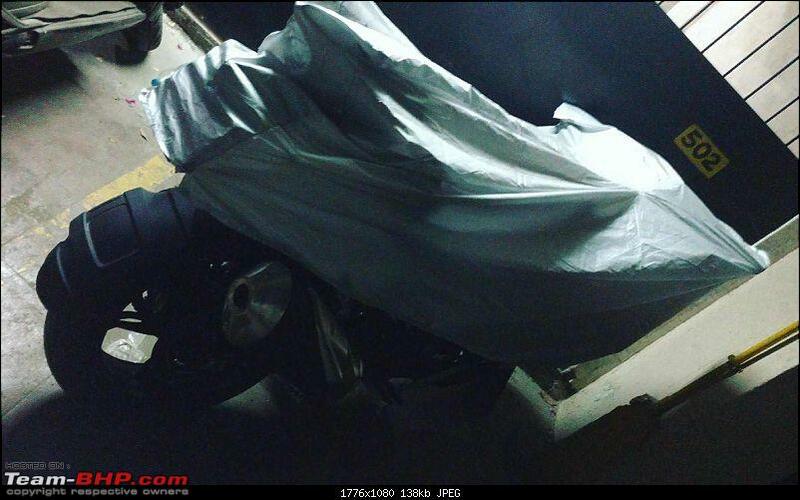 The RR310 has USD forks at the front and a monoshock unit at the rear. A few fellow owners have complained of fork seals breaking very easily although I luckily haven’t faced any such issue as yet. The rear suspension is adjustable for pre-load and the default setting is kept to 5 (neutral/in between hard and soft) on a scale of 10. I find this to be the perfect setup for the road as the suspension is soft enough to glide over bumps without hurting your back. 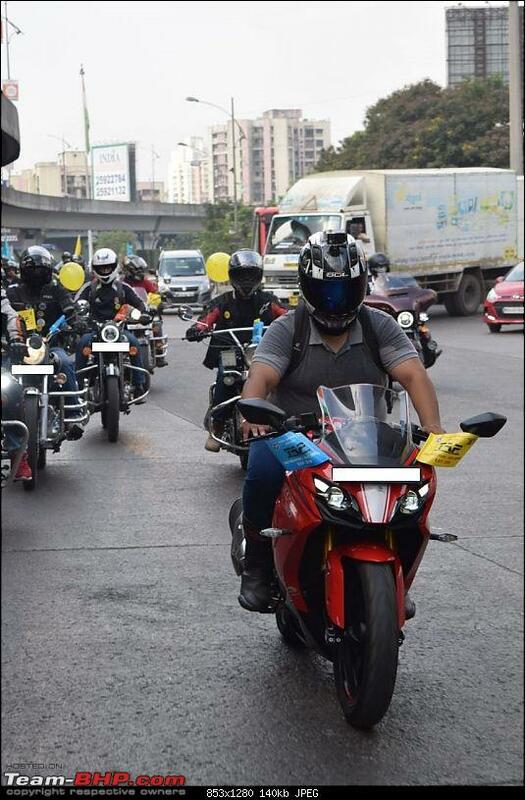 A friend who constantly rides pillion silently disagrees to this though. Braking power for the RR310 comes via Brembo sourced brakes at the front and the rear that help bring the disc brakes and the bike to a standstill. The bite and the progressiveness of the brakes are adequate for me and I have never faced an issue with them. I had to replace the rear set recently with Bybre units (details of the same to follow under the service records section). 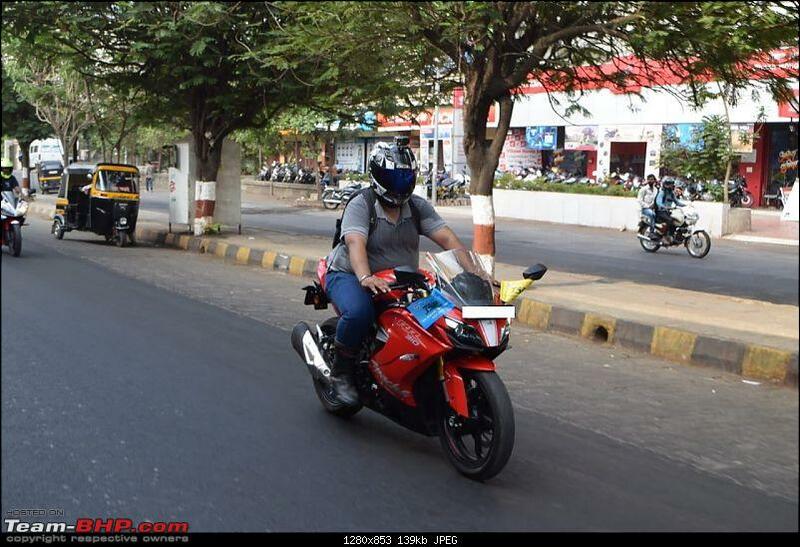 The ground clearance of the Apache RR310 seems to be good enough to go over bad roads and even patches where there are no signs of roads. I don’t recollect any instance but one where the underbelly had scraped the road while on the go. This one time, I was taking the bike down from my building to the road and the underbelly hit one of the steps, causing a plastic screw to get dislodged from the underbelly. I found this surprising because even my low slung Avenger 220 never scraped her bottom on this step, even at slightly higher speeds. To make things worse, the plastic screw wasn’t available at the ASC when the technician pointed out the missing screw to me. I finally asked a friend to get this screw and got it fixed on the bike a few days later. One important issue that I have been facing for the past one month is that the tyre pressure in both the tyres is reducing by a PSI or two in a matter of a week. I have had them checked for punctures but that doesn’t seem to be the problem. I told the technician during a recent visit to the ASC in Panvel about the problem and he completely deflated both the tyres and inflated them again, only for the problem to surface again a few days later. I have asked him to talk to the TVS/BMW engineers about this problem and he has promised to get back to me soon. Another issue that I have been facing recently is that the engine randomly switches off while on the go. 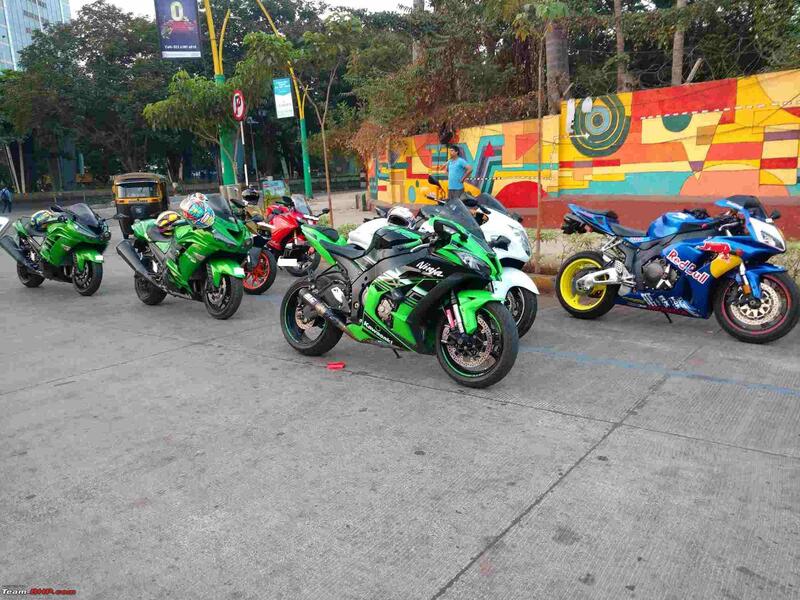 I used to have this problem when I initially began riding this bike as I wasn’t used to the clutch setting and the high rpm that is set at idle (1,500-1,750 rpm to be precise, and yes, that is factory tuned and not changed by me). More recently though, the engine switches off by itself irrespective of the RPM I’m riding at (luckily it has happened only at low speeds of up to 30-40 kmph). I called up the technician, the technician, just yesterday and shared this issue with him and requested him to take this ahead with the TVS/BMW engineers when he talks to them about my irregular tyre pressure issue. It is currently too early to receive an update from him on the same. 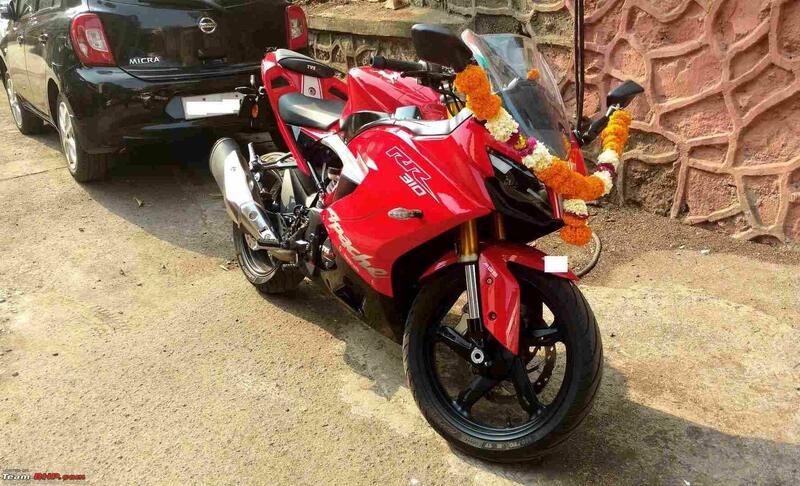 There have been a few niggles but as long as TVS Motor Company is addressing the issues and pro-actively replacing the parts FOC, I find myself content with their services. 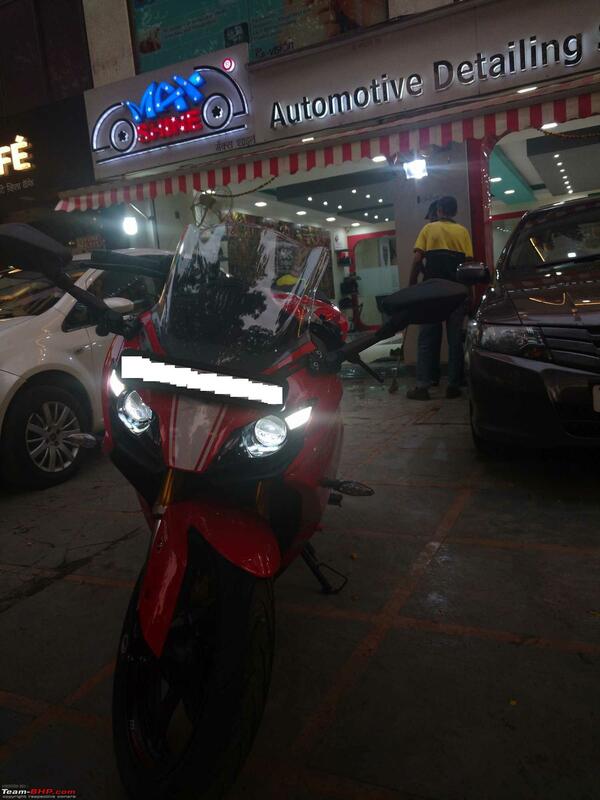 Let me begin by saying that I am very happy with the after-sales service by the guys at Priyanka TVS, Panvel. The sole technician for the RR310, known as Amol, is a really friendly and helpful guy and always makes it a point to tell me what he is doing each time the bike is in for some work. He explains to me in detail if I have any doubts and (trust me when I say this) leaves no scope for improvement. 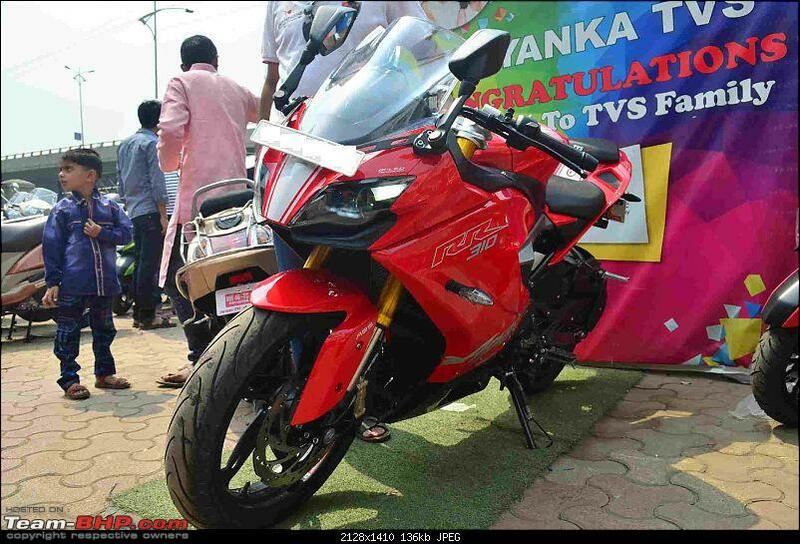 The experience with TVS Motor Company as a whole, meanwhile, was the complete opposite. Their call center employees have little or no information, the regional heads (the one in Mumbai specifically) has got a lot of attitude and lacks the basic sense to talk to a customer/prospective customer (at the time), and the complaints sent to the company via e-mails and social media go totally unheard. 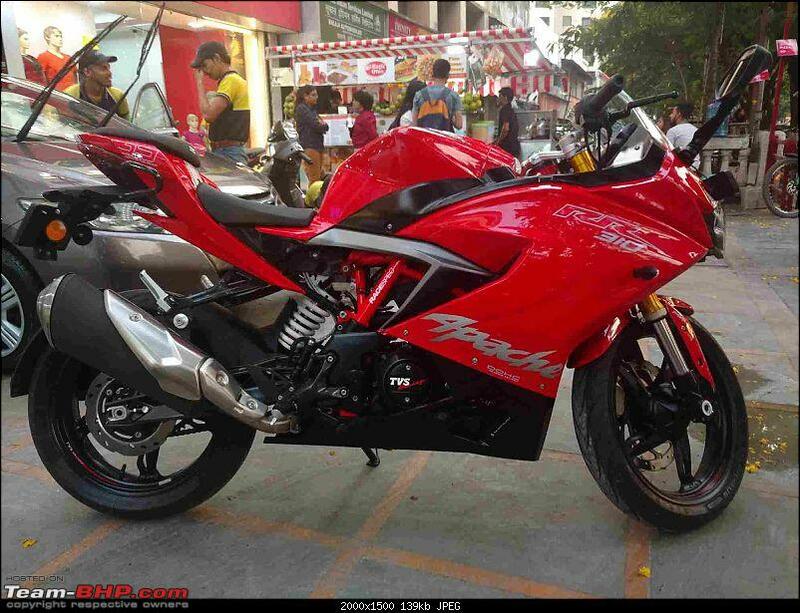 As much as I am happy with Priyanka TVS and their sales and service record, I am equally disappointed with TVS Motor Company as a whole for failing to get back to me even 9 months after buying their most expensive product and flagship model from their portfolio in the country. 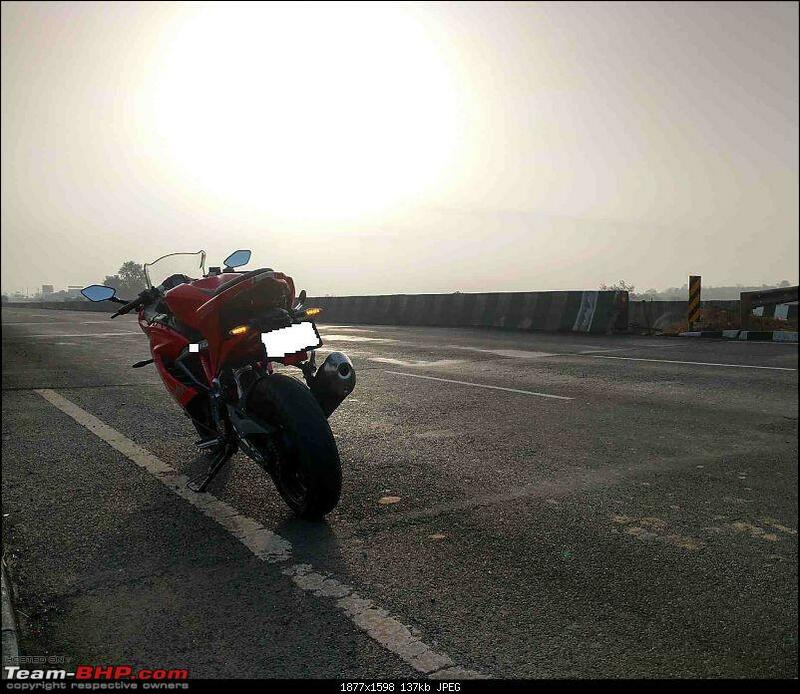 The first service of the RR310 takes place 1000 km's or 2 months after taking delivery of the bike, whichever is earlier. I had almost reached the 1000 km mark in less than a month and hence decided to get the bike serviced soon. I call up the ASC one day and book an appointment for the next day at 11 AM. I ask the guy on call what all is done during the first service. He informs me that the engine oil and oil filter will be replaced, the chain will be cleaned and lubed and the engineer will check the ECU for errors and update the software (if there are any updates, that is). He will also check and inspect various other parameters given by the company (can be seen in the manual as well) and act according to the condition of the same. 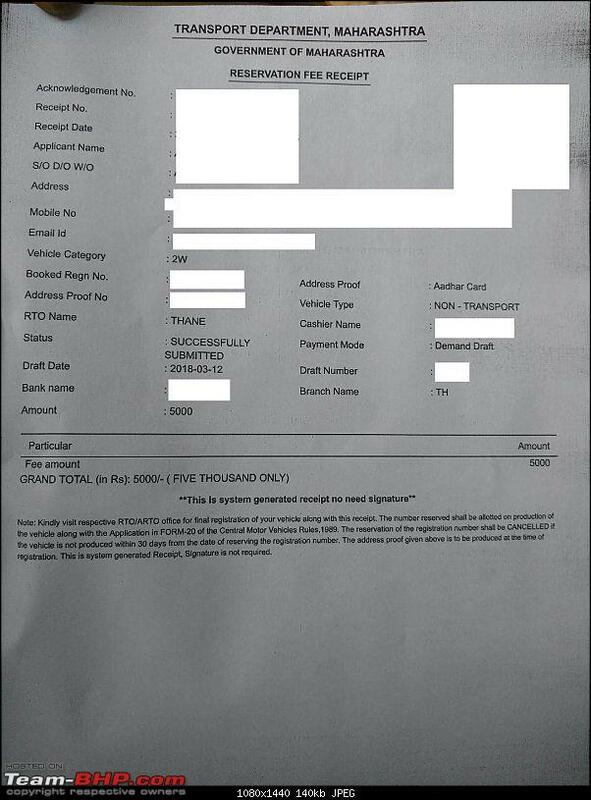 I am given an estimate of INR 2200 to which I ask him for a break-up of the total amount. 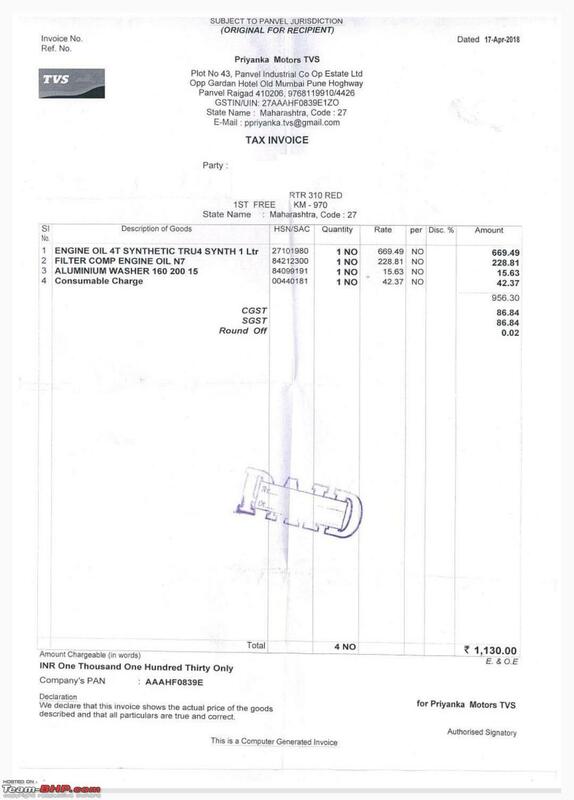 This amount, as specified by him, includes the engine oil, oil filter, consumables as well as a new can of Motul chain clean and chain lube. Since I already have the chain clean and chain lube solutions at home, I ask them if I can bring my own, as it saves me some money when I get it for cheaper (Not MRP) via one of the shops where I head to for all my motorcycle needs. He agrees to the same and I carry both the cans to the ASC. The technician, who is the only guy in the ASC authorized to service the RR310, begins working on my bike about an hour after I arrive as he was already working on another RR310 which was in for servicing the previous day. Not a problem for me, as I sit in the customer lounge with a glass façade that overlooks the service bays. Soon, my bike is on the service bay designated for the 310 and the technician begins his work. A few hours later he is almost done with the work when he shows me the missing plastic screw that I had mentioned about earlier. Since it is not available at the ASC, I take a photo of the screw sourced from another bike for reference and inform him I will purchase it and install it by myself later. He tells me he has checked the ECU and there were no errors but he cannot reset the next service mileage as I haven’t completed the exact running of 1,000 km's. With only 20-25 km's pending to hit that mark, I ask him to give me half an hour during lunch time to complete the pending mileage. 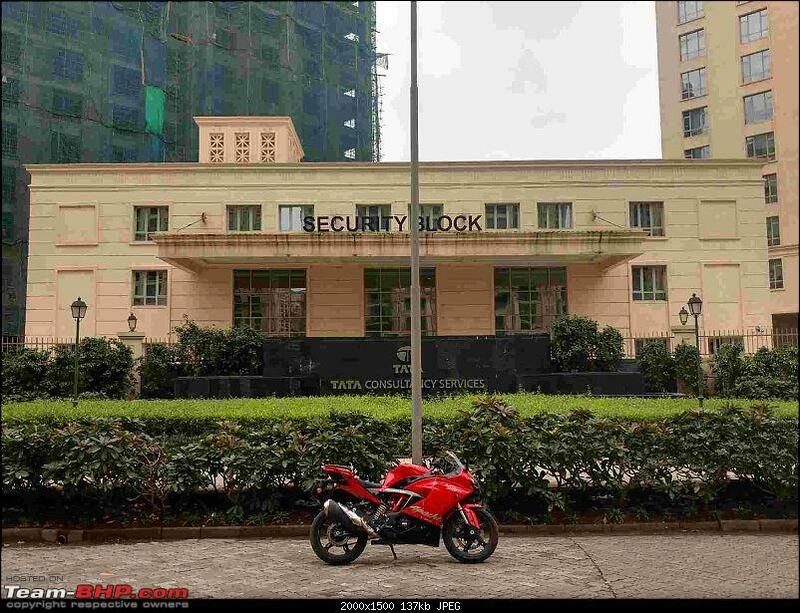 As lunch time begins at the ASC, I take the bike out for a spin, head to D.Y. Patil stadium and come back to the service centre in half an hour, surpassing the running of the 1000 km's mark. Lunch time is also over and the bike is back on the bay, followed by a quick service schedule reset and soon enough, I’m on my way home after paying a bill of INR 1,130. Post the rainy season, I call up the ASC to schedule an appointment for the second service as the six month period is up while the odo still stands at 3000 odd km's against the 5000 km's it was supposed to be run by then (yes, I don’t prefer riding the bike in the rains). I ask one of the SA’s (whom I recognize by now but will still keep his identity anonymous as the issue was solved later) what all is to be done during the second service (I had gone through the manual before making the call and hence knew what was to be done but just wanted to double check) and this guy tells me that the engine oil and oil filter need to be changed while the chain needs to be cleaned and lubed as well. Basically everything done at during the first service is being repeated. Having read the manual, I clearly remember that only the chain needs to be cleaned and lubed while the technician needs to check and inspect a few elements of the bike as he did during the first service. I ask him to confirm what he just said and he says this is the way it is given in the manual and this is what every RR310 undergoes during the second service at their (Panvel) dealership. I tell him to confirm my appointment and that I’ll talk to him about these things when I meet him in person the next day. Next day, I go to the ASC with the manual in my hand and ask this guy again why the oil and oil filter have to be changed during the second service. He simply tells me to check the manual and adds that they go by the manual and if I don’t adhere to what is given in the manual; I stand to lose warranty for the same. I open the owner’s manual in front of him and ask him to point out where the details of the engine oil and oil filter change are given for the second service. This guy is stunned by now for the fact that I, unlike most customers he must have faced till date, came prepared with all the knowledge in the book. The same SA now sheepishly hides behind the excuse that he read the first service column as the second service column and hence the confusion. Confusion cleared, I ask him to quickly take my bike inside for the second service. As usual, I’m carrying my set of chain clean and chain lube and give it to the technician once the bike is on the bay for servicing. About 45 minutes of work and a short test ride later, my bike is ready to go. 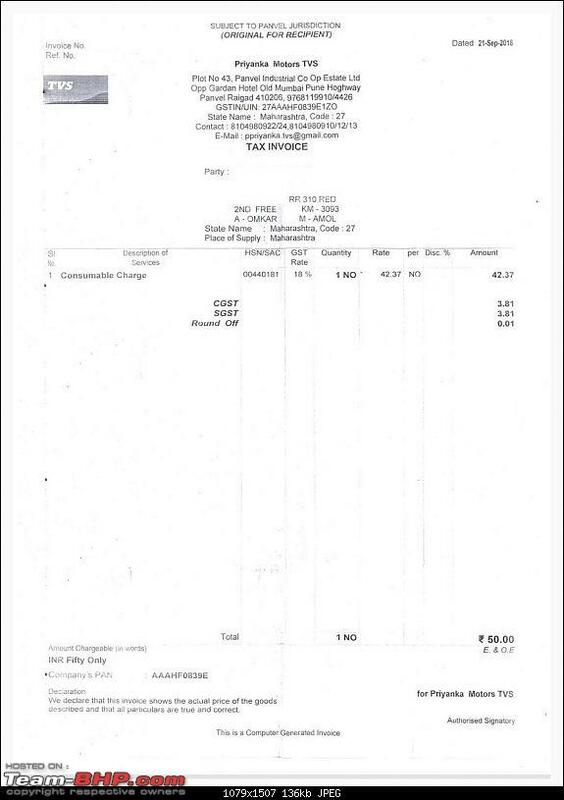 Total cost incurred for second service: INR 50 (charged for consumables). NOPE, this isn’t a typo. 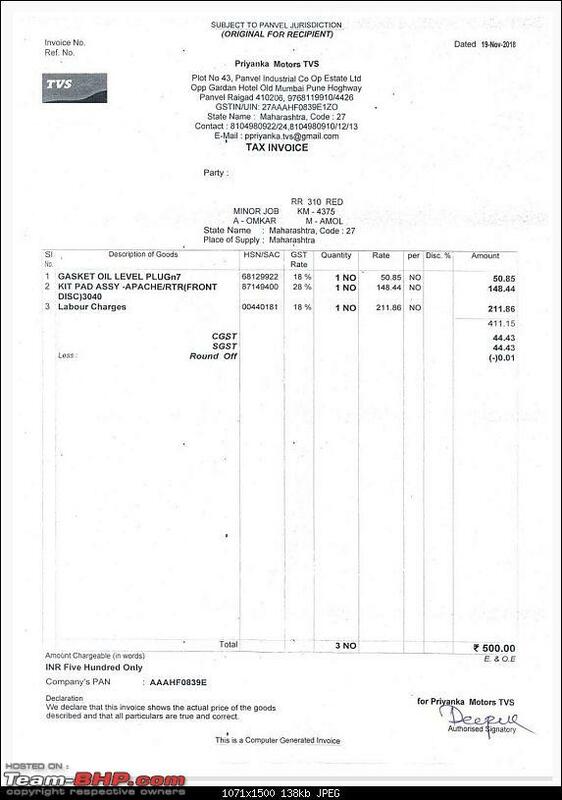 Check the scanned copy of the bill below. I hope this is a fitting answer to those who doubted that the RR310 would be an expensive proposition with service costs in mind. Another point worth mentioning here is the customer satisfaction level the guys at this ASC aspire for. I remember having broken the cover for my chain lube spray and lost the nozzle extender too in the process. After cleaning and lubing my chain, the technician asked me if I would like to throw away the broken cover for the chain lube spray and get a proper one with the nozzle extender which he was about to chuck with another chain lube can that he had finished using a while ago on the same day. Had he not offered that, it wouldn’t have made a world of a difference to me or him; there was nothing for him in it anyway. But this gesture of his to even ask me before just replacing it randomly made me realize that these guys really care for the smallest things when it comes to their customers, unlike a few companies that believe in just filling the form to get a better impression in the eyes of the parent company (the manufacturer, in this case). The technician also told me about a part that was due for a silent recall of sorts but wasn’t currently available with the ASC. This part would apparently reduce the annoying chain noise that a number of 310 owners have been complaining about. I told him to notify me on call or Whatsapp (since we were in the same Apache owners group of the Panvel dealership). 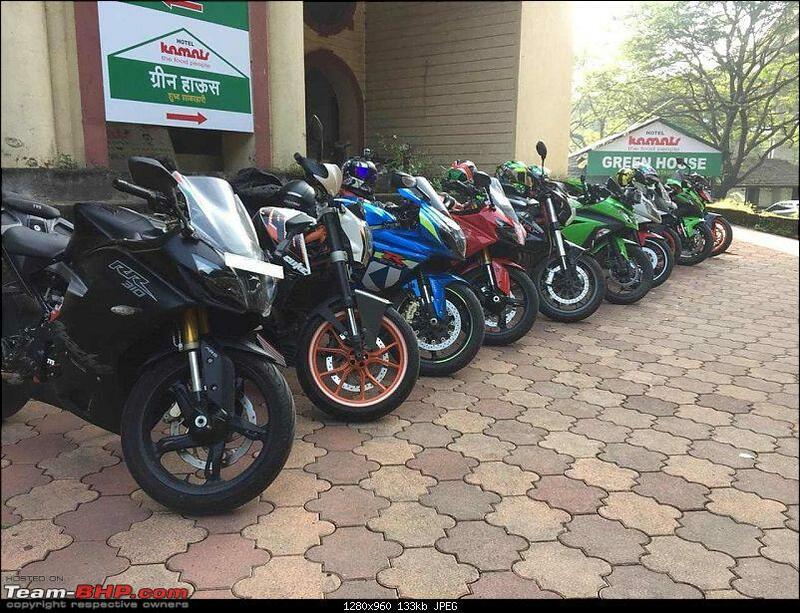 I also told him that I will mostly come on a Sunday if I plan to go for a ride to Lonavala. He said he has his weekly off on Sundays. Not a problem, I thought, I’ll go some other day. But before I could express this thought, he told me to give me a call a day in advance and he would come in especially on a Sunday just for 15-20 minutes to replace the part in question. It was this time that I realized that there cannot possibly be a better ASC than the one I’m currently visiting and hence I’ll continue with my patronage at this dealership/ASC itself. Hyundai Motor India and Modi Hyundai Authorized Service Centre, please take a lesson or two from these guys. My last visit to the ASC was a fortnight ago to change the rear brake pads. I was finding a gradual dip in the initial bite of the bike’s braking capabilities when a friend pointed out that the brake pads at the rear would need to be replaced soon. I was to go to the ASC anyway as they had to replace the part which would reduce the chain noise. I called up the technician at Priyanka TVS in Panvel and asked him if a set of the rear brake pads were available. He confirms the availability of the same as well as that of the part due for replacement. I head to the dealership the next day and in goes my bike to replace the break pads. The technician first replaces the part that is supposed to reduce the chain noise. A few minutes later, he gets the brake pads and upon having a closer look, calls me to the service bay. He tells me that the Brembo units are unavailable and Bybre is all they have in stock. What the hell! Why do you do this TVS? Apparently the reason behind this is the fact that TVS received many complaints that the break pads were too expensive (INR 1000 a pair for the rear set) and hence they replaced it with a more cost effective model (Bybre costing INR 190). I don’t understand if you’re buying a motorcycle worth approximately INR 2.5 lakh they why can’t you afford the break pads worth INR 1000? Silly if you ask me! (Personal opinion and not intended or pointed towards anyone whatsoever) As the current break pads have a life of about 500-700 km's before the go bald, I end up get them replaced with the Bybre units (regretting this already). 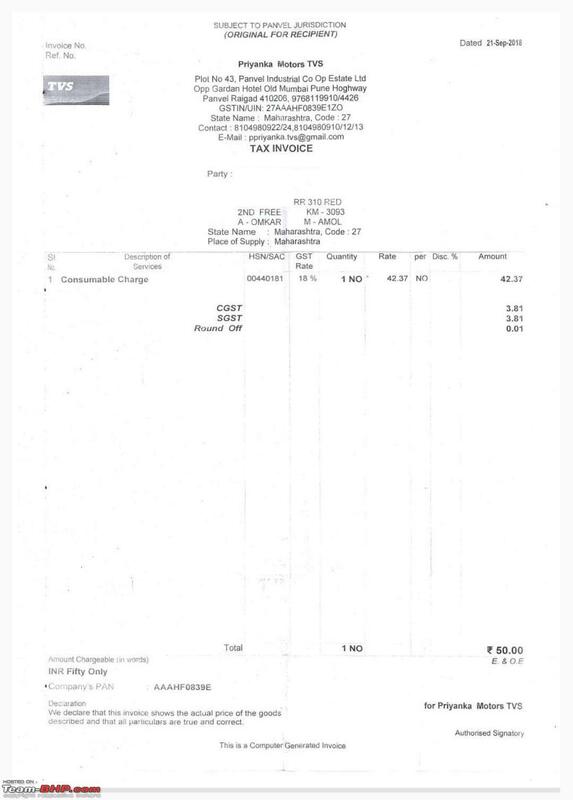 The total bill comes to INR 500. Wait, what? I had forgot that this is not a scheduled service and hence they would be charging labour on this job. 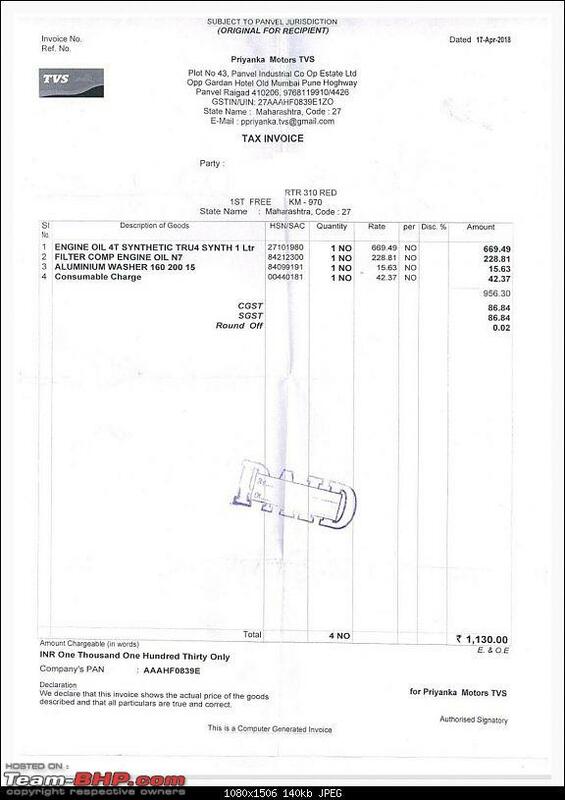 So INR 190 for the break pads, INR 211 for the labour (more than the cost of the product installed itself) and INR 50 for some gasket (I have to ask what this was for). I tested the new brake pads over the past few weeks and I feel sad to report that the initial bite and progressive braking both have taken a considerable hit, now taking longer to stop than before. I was probably spoilt by the Brembo brake pads and hence this opinion. Meanwhile, I have requested the ASC to keep the Brembo brake pads in stock (both front and rear) as I might plan to change them soon. A shift sock was added to the gear lever even before I took delivery of the RR310. The red coloured sock matches the body colour as well. Barely a few days after getting the bike home, I got her detailed and ceramic coated at Maxshine, Thane. 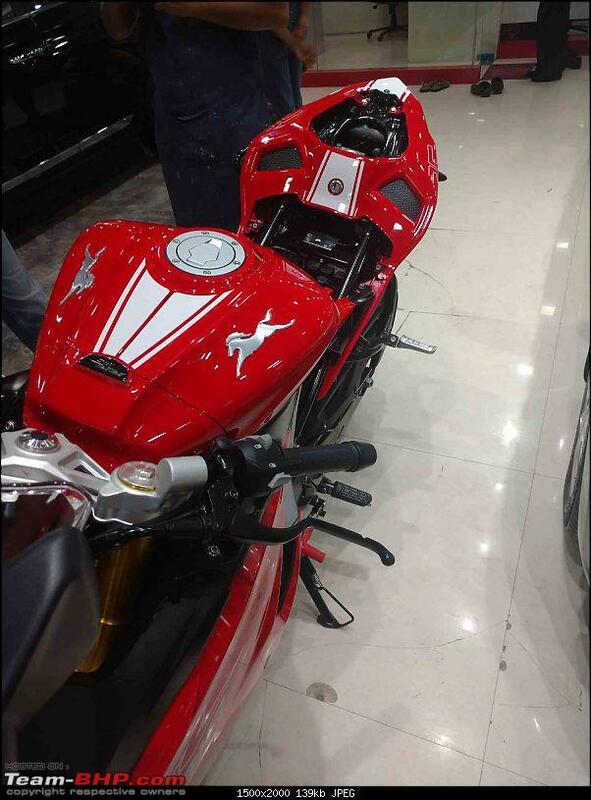 The initial results were splendid and the bike and the red paintjob shine better than the factory finish. I did the curing process (touch-up for the ceramic coating in lay man’s terms) and it did bring back the shine that was lost after using the motorcycle for 6 months. The curing also removed most of the swirl marks save for a few, something which I’m still kind of unhappy about. That said, the guys at Maxshine did a splendid job and a sincere heartfelt thanks for the same. The ceramic coating has made a world of a difference and added more glamour quotient to the already beautifully sculpted beauty. I had planned to remove the tyre hugger ASAP but later thought of getting it removed during the first service of the bike. 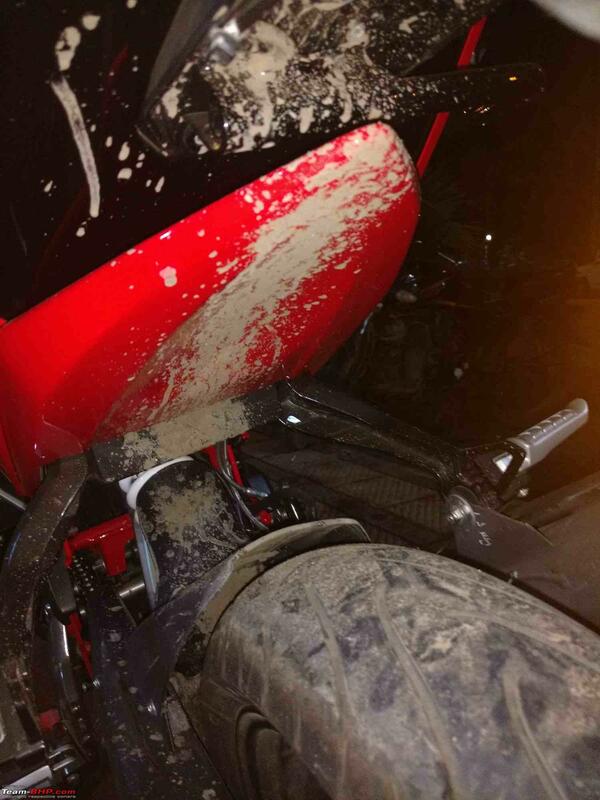 Not only was the ugly tyre hugger spoiling the look at the rear of the motorcycle, I wasn’t going to be needing it anyway as I don’t intend to use the bike during the rainy season. 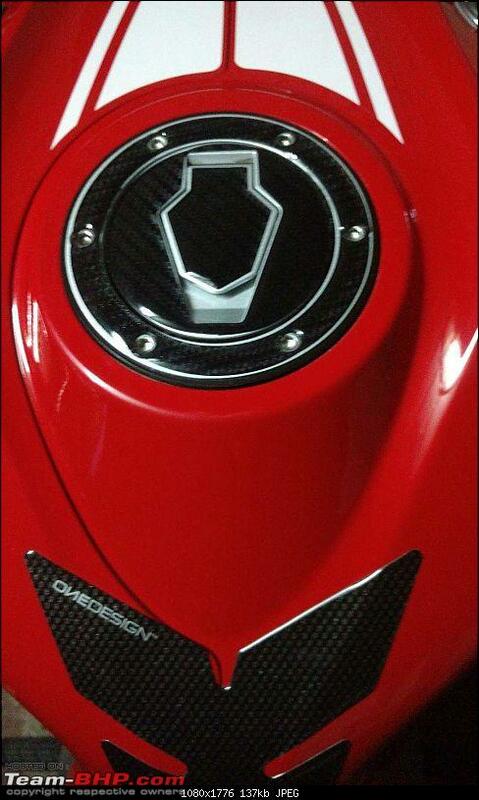 I bought a One Design branded tank pad from Performance Racing Store (PRS) worth INR 1500. I took the help of a friend to apply the tank pad on the bike and it worked out to be a fairly easy and quick job. 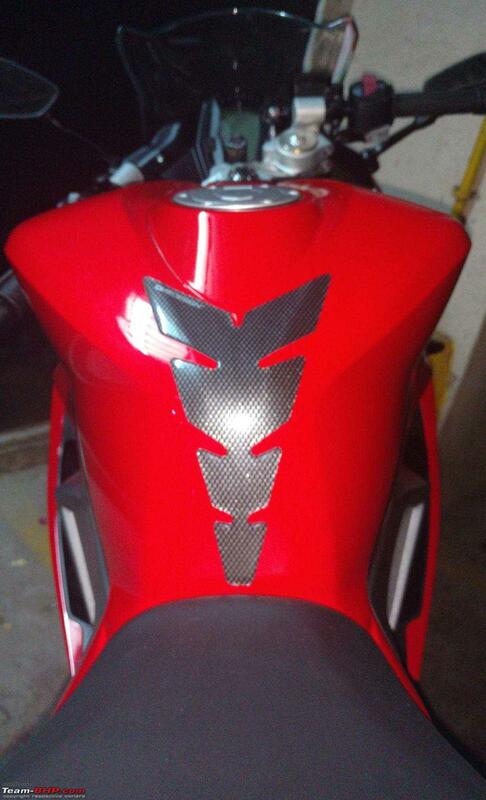 What I noticed during a foam wash of the bike though is that one of the parts of the tank pad came off. I don’t think PRS would be able to do anything for this and hence didn’t even bother contacting them for the same. 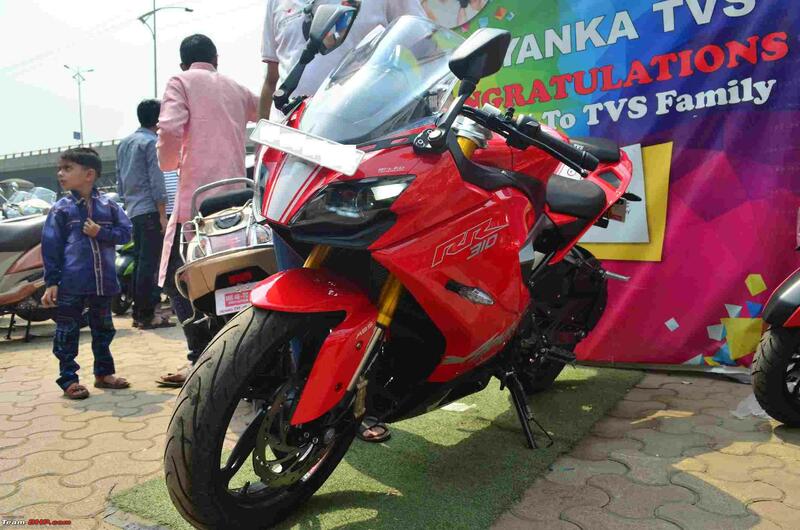 Priyanka TVS gave me a synthetic cover with their branding on it FOC with the bike. 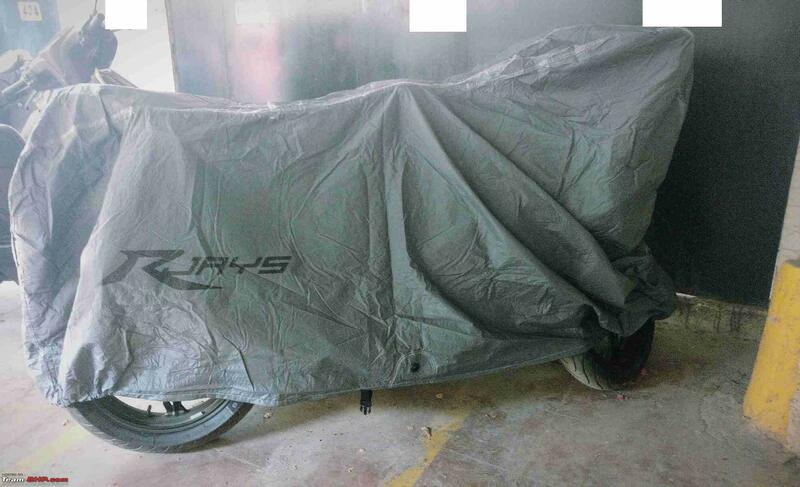 I reached home and began covering the bike, only to realize that the cover in question was made keeping in mind the size of TVS scooters and main-stream bikes, not the Apache RR310. 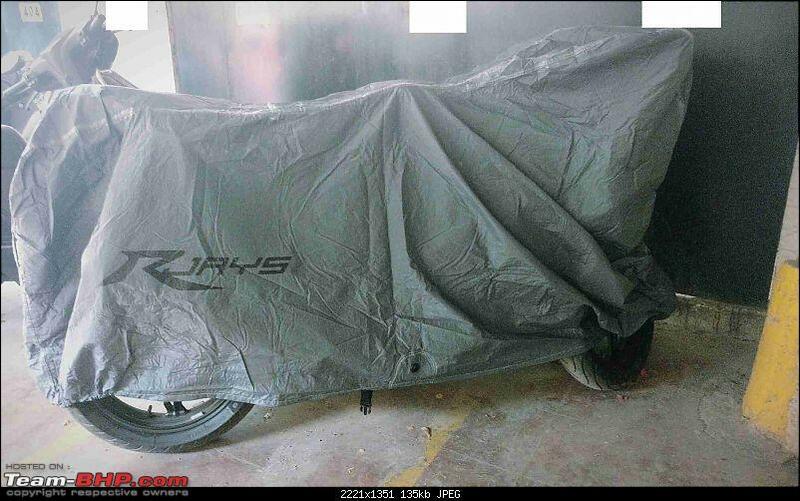 Post the ceramic coating, I head to Bachoo Motors and get myself an Rjays cover for INR 3,000 (premium one, XL size with the soft cotton type material on the inside to keep my beauty free of dust and other naturally harmful elements. 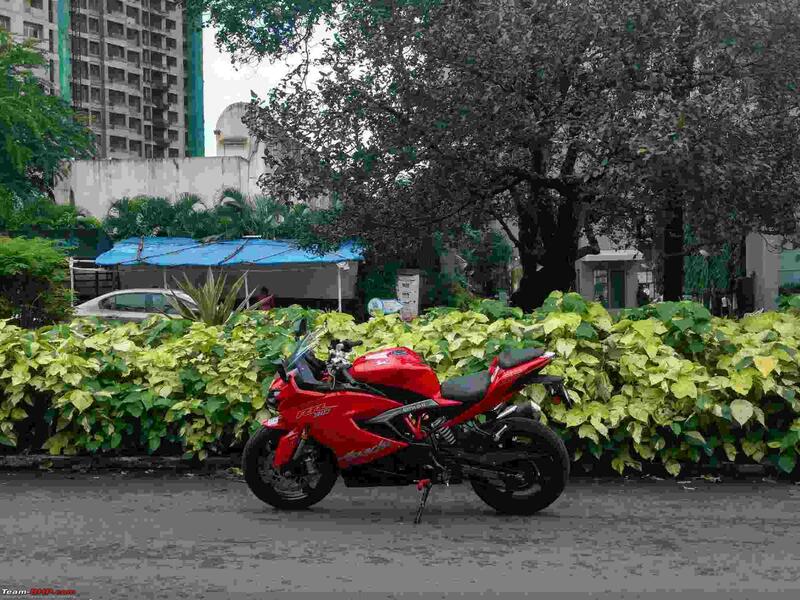 I buy a red coloured paddock stand from Sunshine Gears, Thane as it has been my one-stop shop/solution for all motorcycle related purchases. The owner, Kishore, was very accommodating with my demands and was quick to arrange for a red coloured paddock stand on order. The paddock stand is working fine and helps me to clean and lube the chain (something which I religiously do every 500 km's) and clean the bike in detail at the convenience of my home (rather building). The only drawback for the paddock stand is that the L brackets are rubber coated and not rubber dipped, something which the dealer who I was conversing with via Sunshine Gears, promised to replace. I am yet to get an update from him on the same. 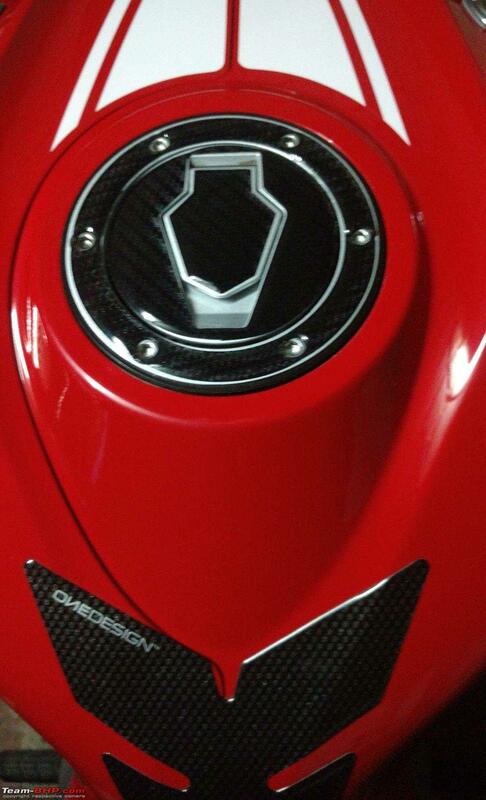 I got a carbon fibre designed fuel cap to match my tank pad on the bike. I ordered it from this website called ‘The KickStart Store’. There were a few hiccups regarding the delivery but the owner (I’m guessing) kept me updated all throughout the process until it was delivered to me. I had some issue with the outer ring coming off and this guy was quick to send a replacement for the same. Overall, I would recommend to go ahead with his products if they are to your taste. With the current tank pad looking a bit out of place now, I plan to order a new tank pad (carbon fibre design once again), although at a much cheaper cost via AliExpress. 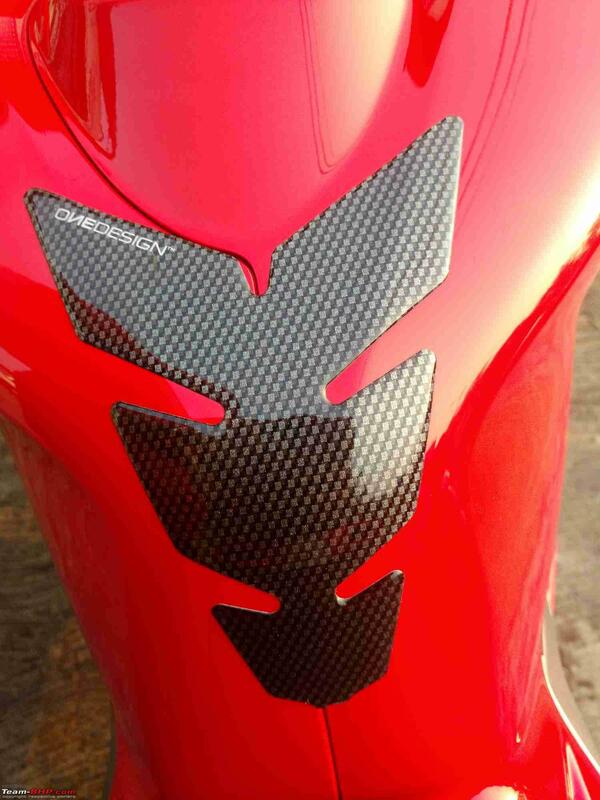 I’ll share the details once it is put up on the bike. These are a few safety upgrades that I’ve been searching for since a while time. There are a few companies in the market such as Venom Ancillary which do produce frame sliders for the RR310, but either I don’t like their designs or I don’t find their products confidence inspiring (no offence meant to any person, company or customer using their products). The instrument cluster is prone to scratches and already has a few of them which cannot be undone, even with the hep of ceramic coating. 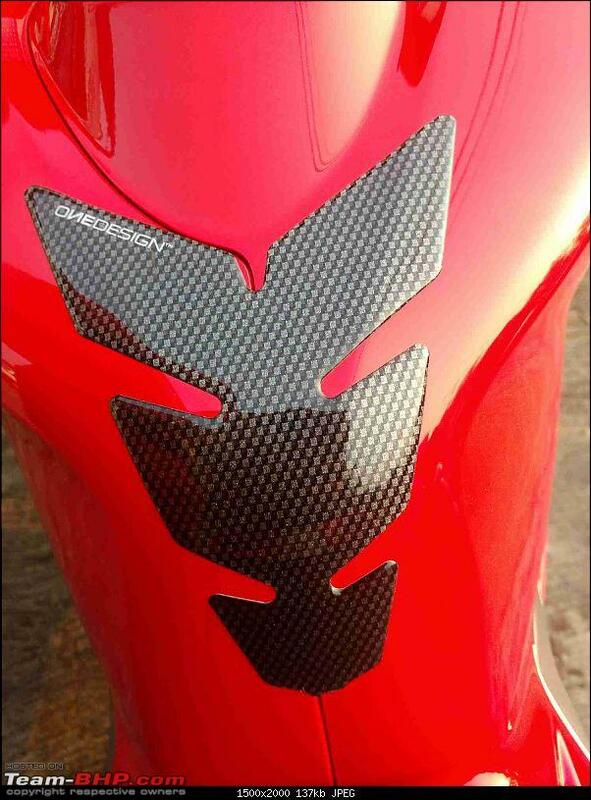 Hence I’ve been on the lookout for a scratch guard for the instrument cluster of the bike. I haven’t been able to find anything in the open market and hence I’ve asked a friend in the automotive business to try and source it for me. Let’s see what happens ahead. I plan to get white coloured rim tapes for the front and rear alloy wheels from AliExpress too. I don’t recollect the price. Another issue that I’ve faced on the RR310 is that I constantly tend to move ahead on the seat while braking. To counter this, I’ve planned to install traction dots or tank grips on my bike. This one is still in the research stage. I have searched a lot on the web but haven’t been able to find a radiator guard for the RR310. 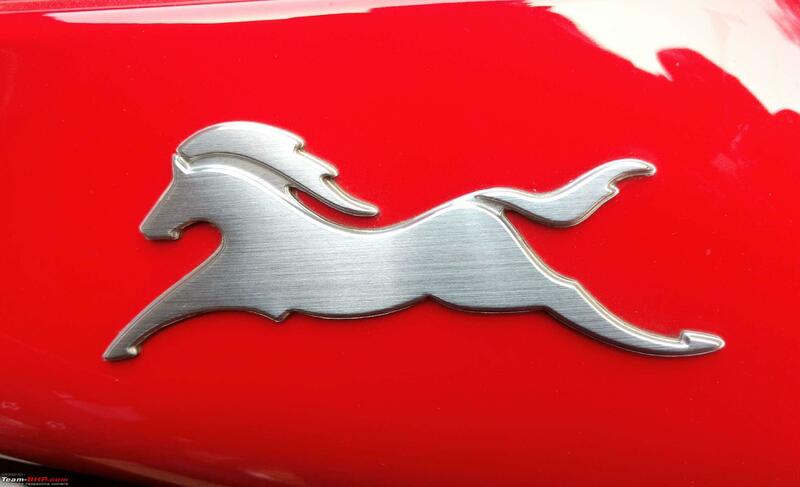 I’ll probably have to wait till some Indian brand like Autologue Design comes up with one. Although this won’t be done till the warranty period is over, I’m still contemplating how useful an aftermarket air-filter would be for me. Having used a K&N unit in my Avenger 220, I know the gains and drawbacks of such units. It will be a while before I think and research about it in depth before taking the plunge. Last edited by AtheK : 6th December 2018 at 15:59. 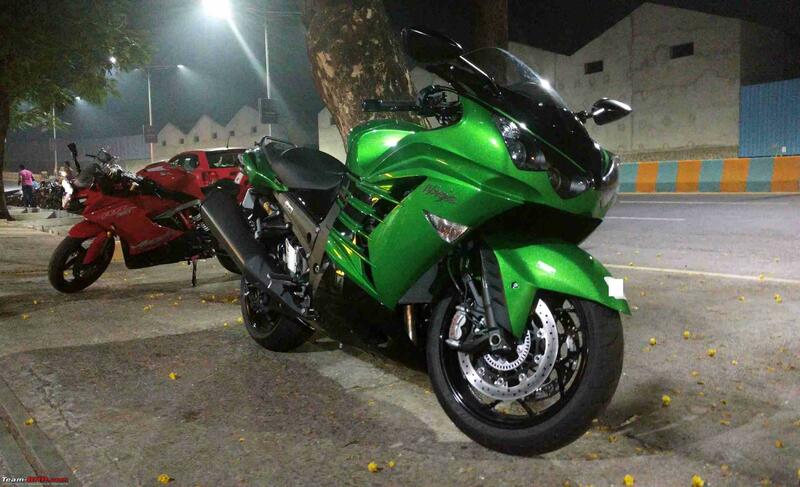 Would you share more details of the aftermarket setup you had on the Avenger 220? Was it a stock replacement filter? If not do share the size of the new jets you'd opted to keep the fueling in check. Last edited by ashwinprakas : 6th December 2018 at 16:54. Thank you for the compliments. Yes the bike indeed looks quite big for it's class. 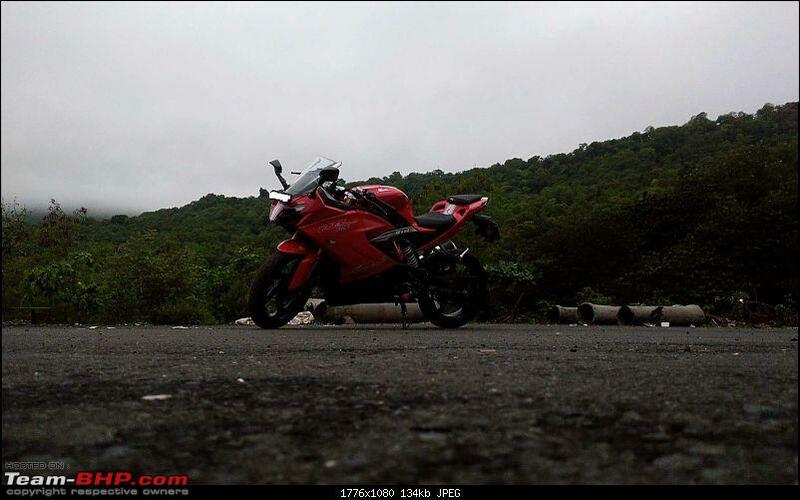 Here is an image I took during a breakfast ride to Lonavala. 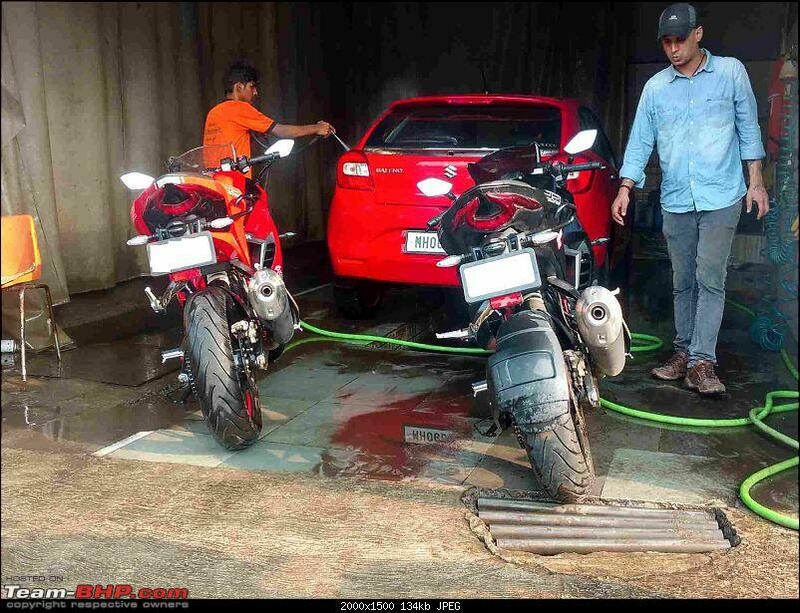 You can see the that they almost match the height of the Triumph's, although it's look higher than them due to the angle of the photo. Thank you AtheK. I've been following your ownership thread on a regular basis and would like to thank you for all the inputs that have helped me in penning down this review. It wasn't a stock replacement filter. I got the universal conical shaped filter which IIRC, was model number RC-1060. I didn't opt for the new jets, just had to adjust the level of air and fuel mixture. Got that done from my local FNG and it was good to go. 1. You'd simply be messing up an otherwise perfect machine. 2. You're just the right type of customer that the typical 'Indian Tooner' is waiting to try his tricks on. Saying as I've been there and done that. Plus a free flow lifetime filter is the last thing you should be thinking about riding in Indian conditions, wouldn't want your valve seats to go for a toss simply because you decided to take a country side route or your motor to get hydro-locked because you decided to ride through a deeper than ideal puddle. Not to mention your MAF sensor/throttle body/Injector which I presume are all expensive parts would also be affected. When you come to think of it, the gains(If any) simply doesn't justify the means. And I say that in spite of running on several free flow intake setups properly and painstakingly dialed in to return an optimum burn, other than the audible intake roar and minute performance gains which I doubt could be verified on a Dyno, considering that there were no gains at all, only tuning concerns especially when riding interstate, not to mention the carb slide going for a toss every now and then which eventually led me to go for a cable slide carburetor from the CI Bullet 500. 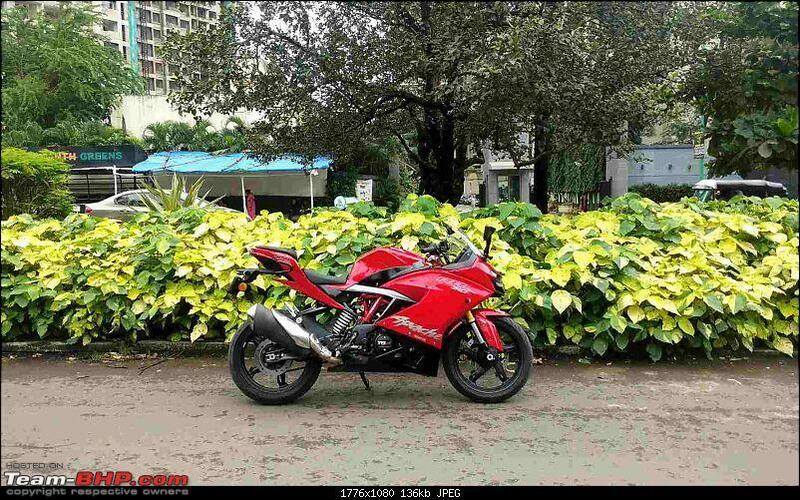 So do think hard before taking the plunge, the RR310 might just not be as forgiving as the Avenger. Last edited by ashwinprakas : 6th December 2018 at 21:15.